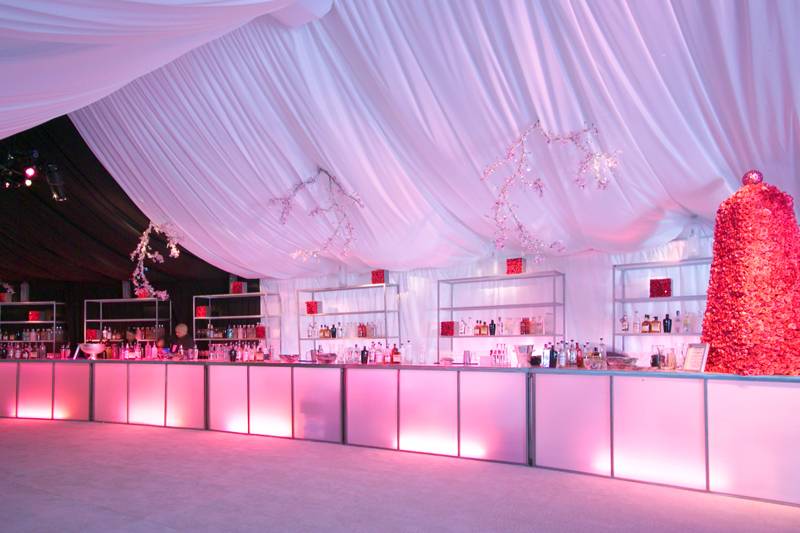 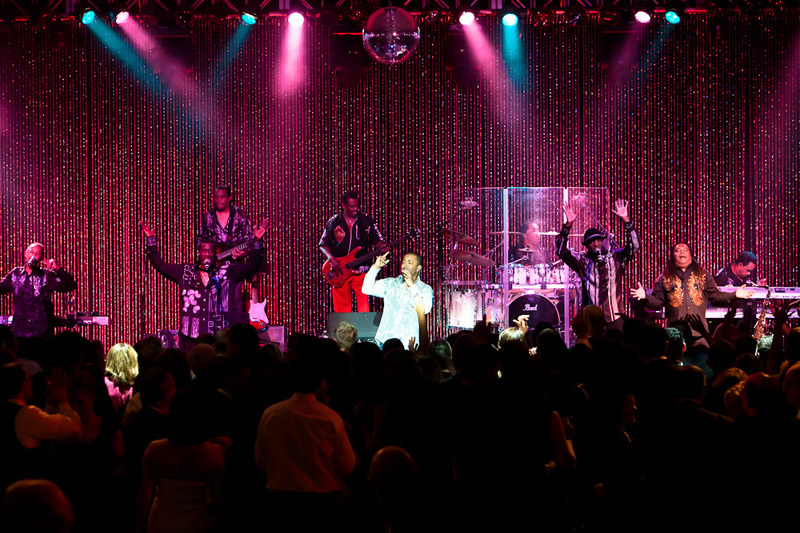 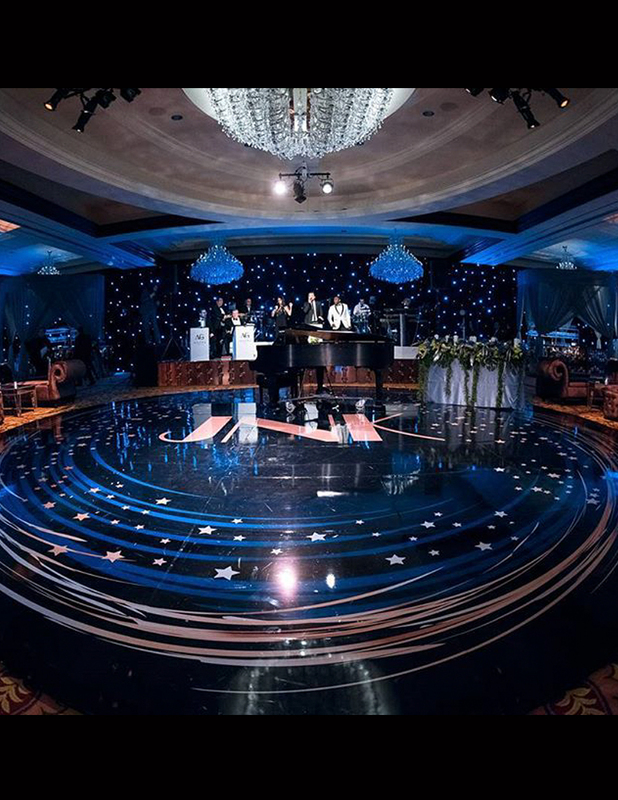 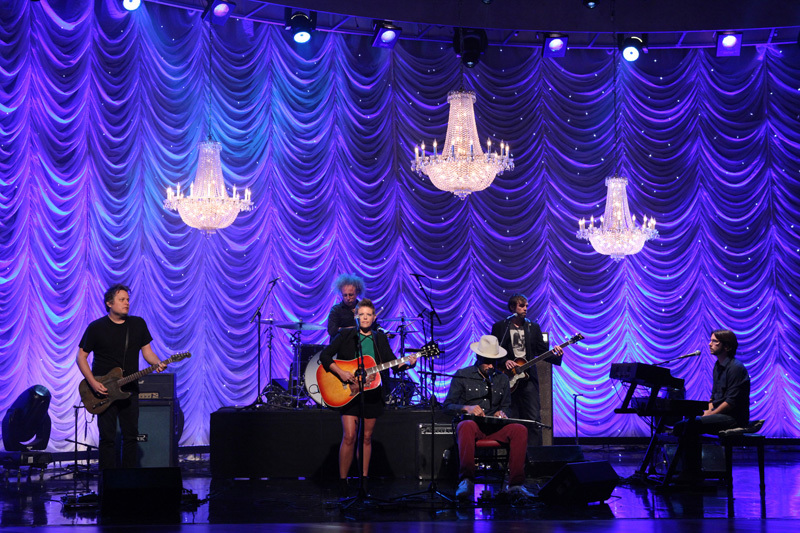 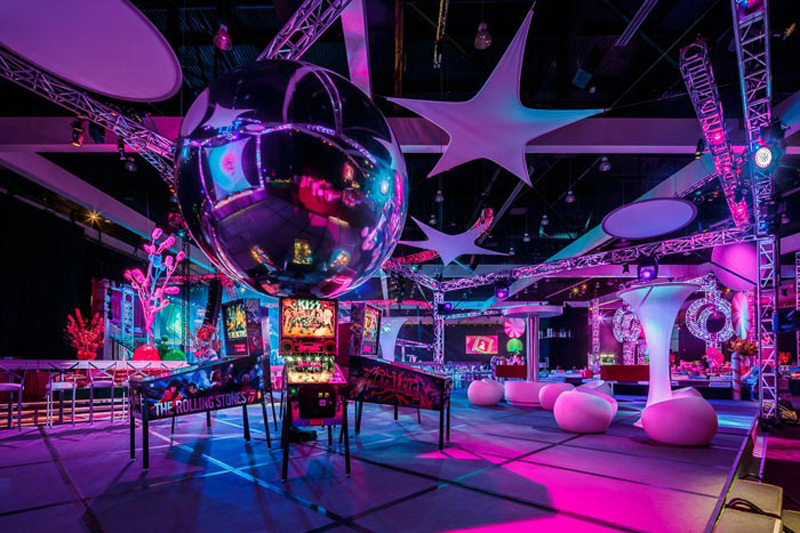 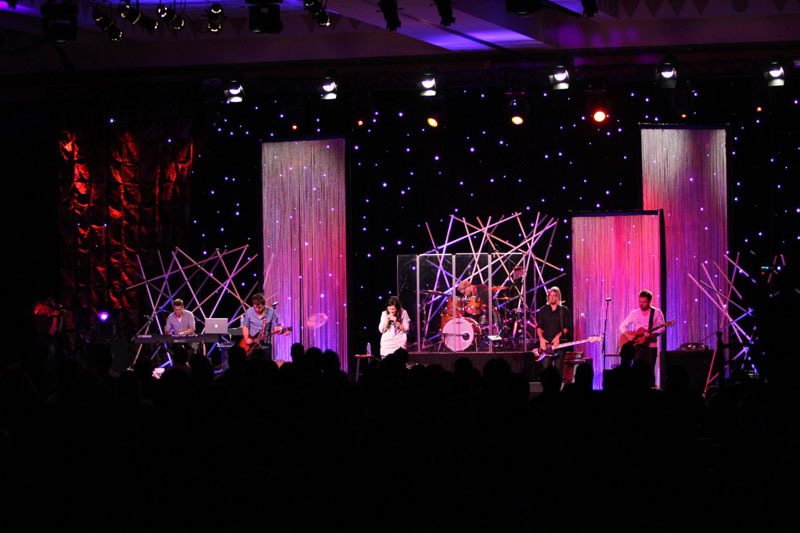 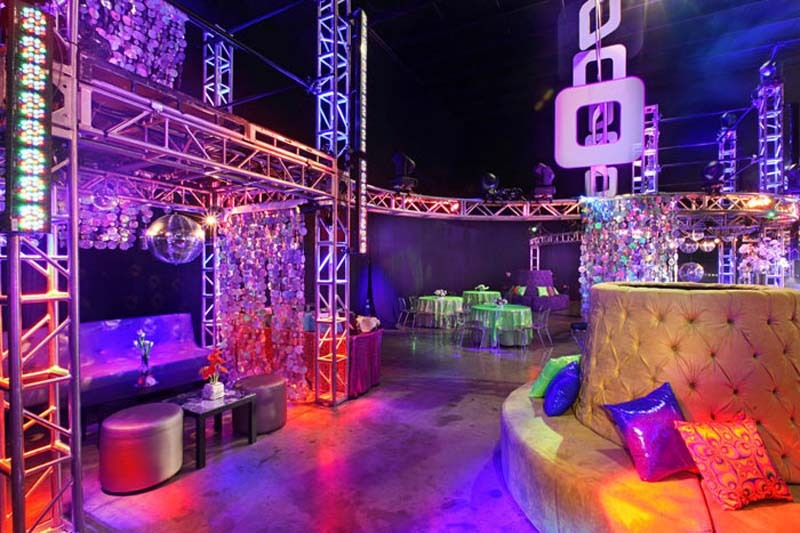 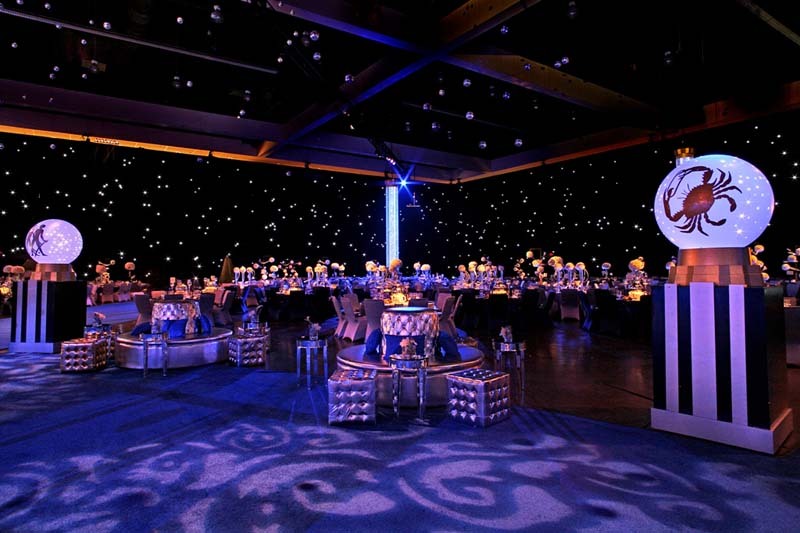 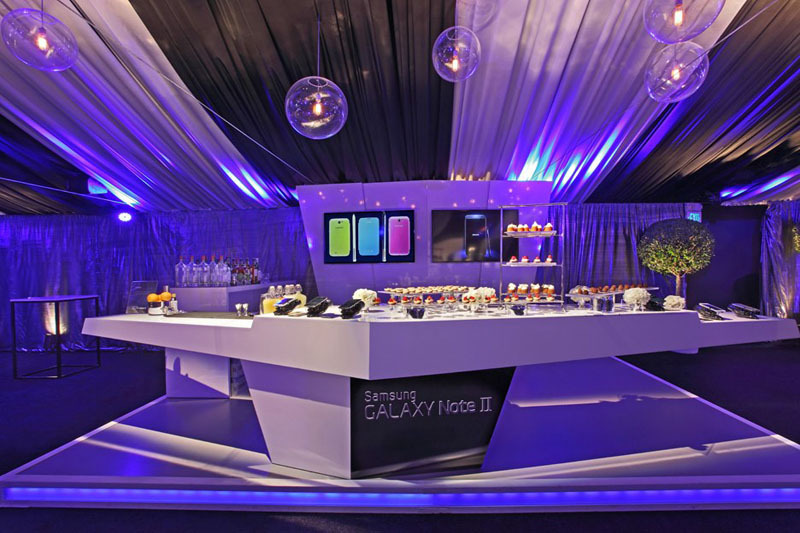 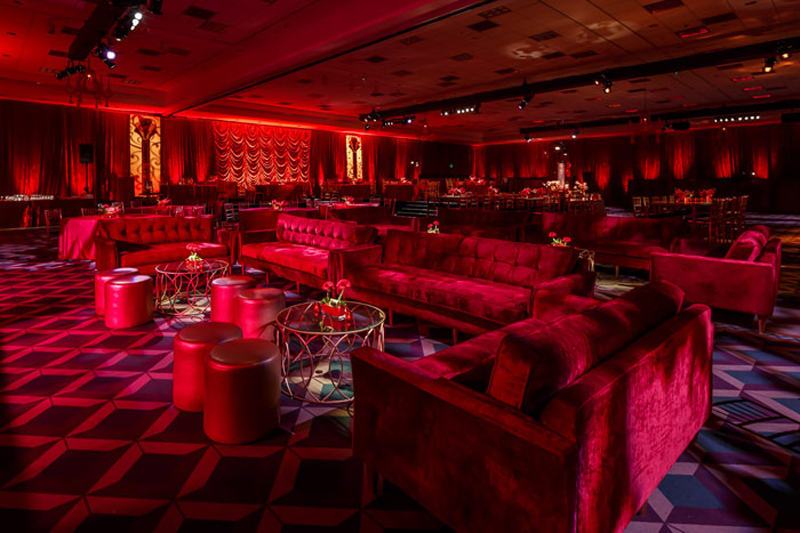 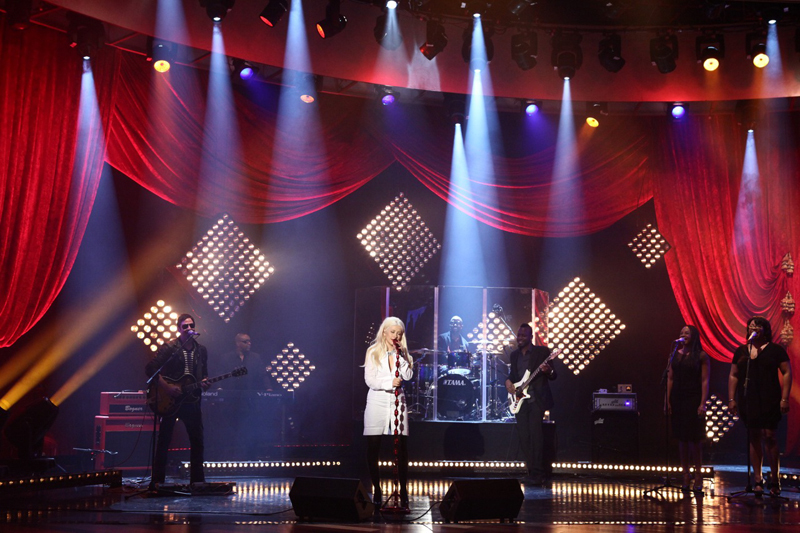 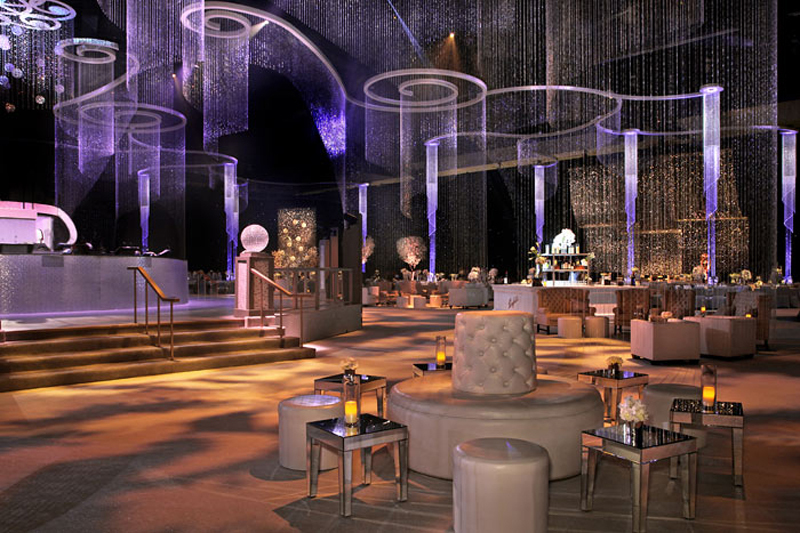 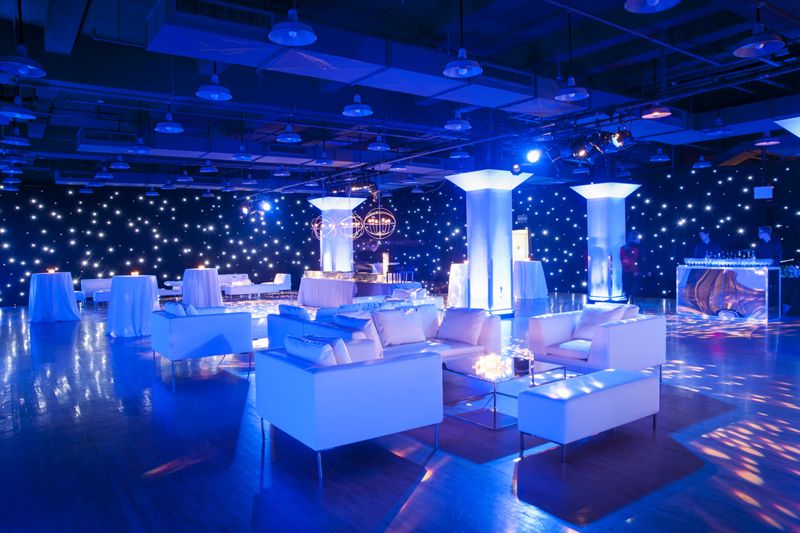 Colin Cowie produced birthday party using Mag LED Walls and Star Halo Tiles as a unique stage backdrop at the Lowes Regency Hotel in NYC. 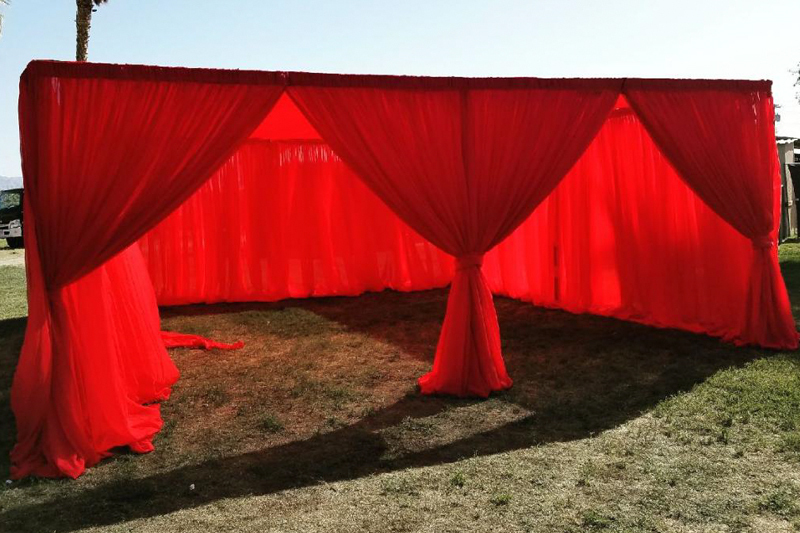 We installed. 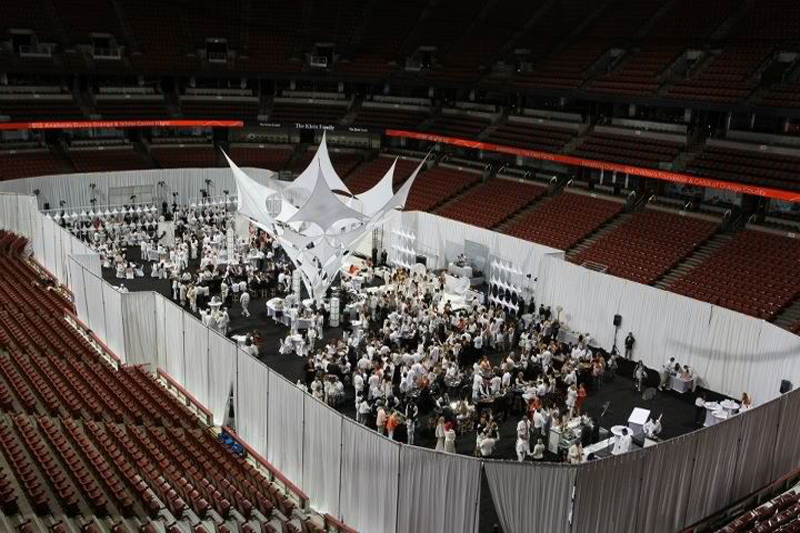 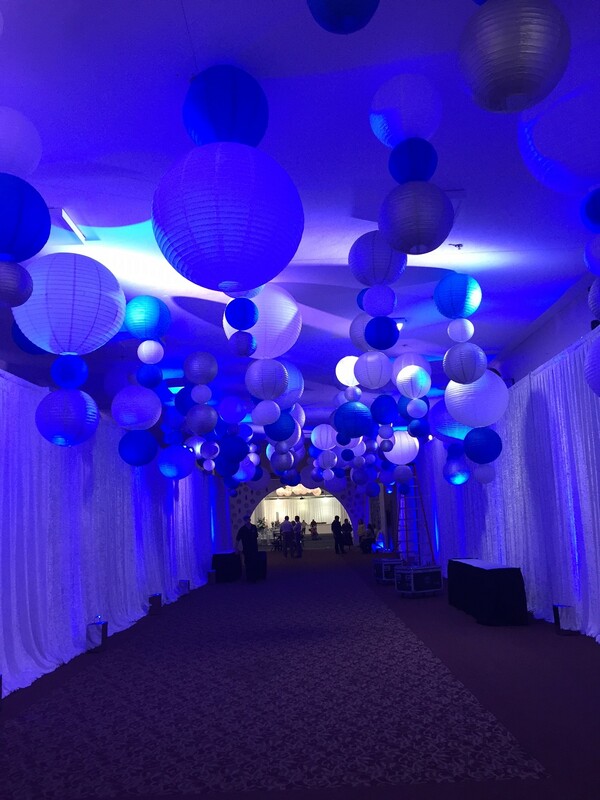 AAV Tallahassee event featuring white Panne Velvet masking drapery down a hallway creating an entry way for the event. 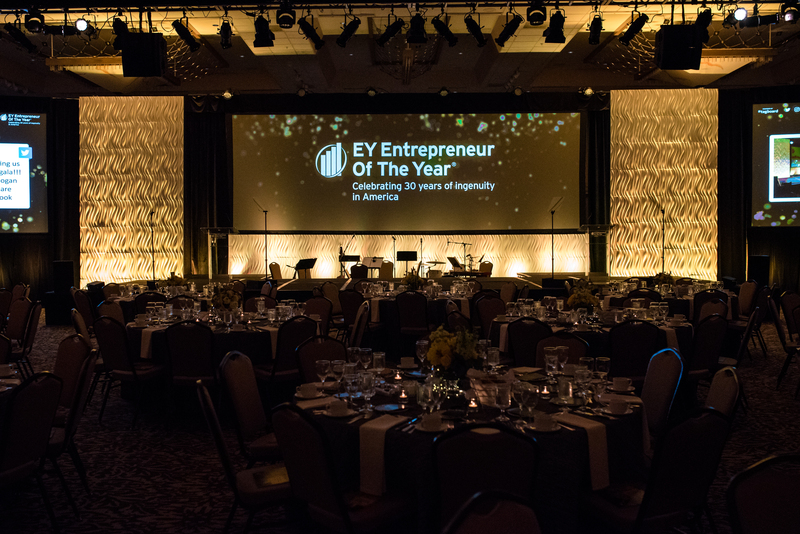 Vector Tile Screen Surround and Stage Sets for the Ernst & Young Entrepreneur Awards using Chrome Vector HD Tiles in Surf. 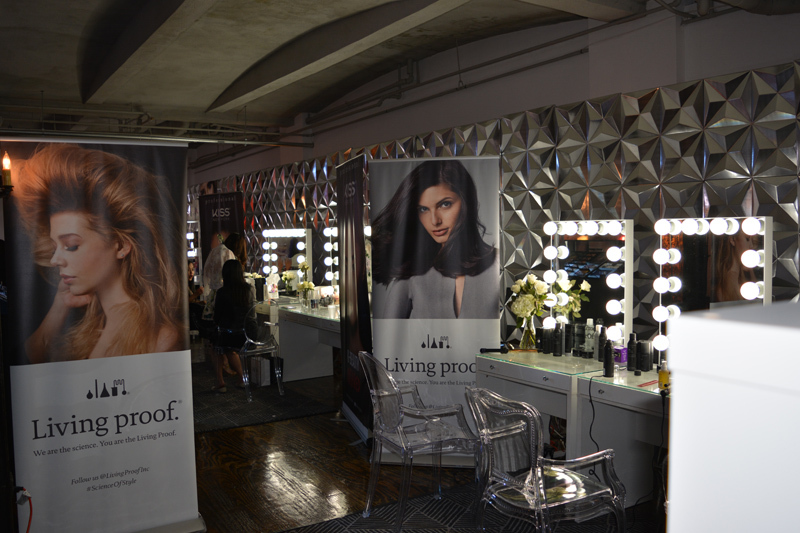 2017 LAFW - LA Fashion Week - Vector HD Tiles in Chrome Cristal create the backdrop for the beauty bar at the opening night gala event. 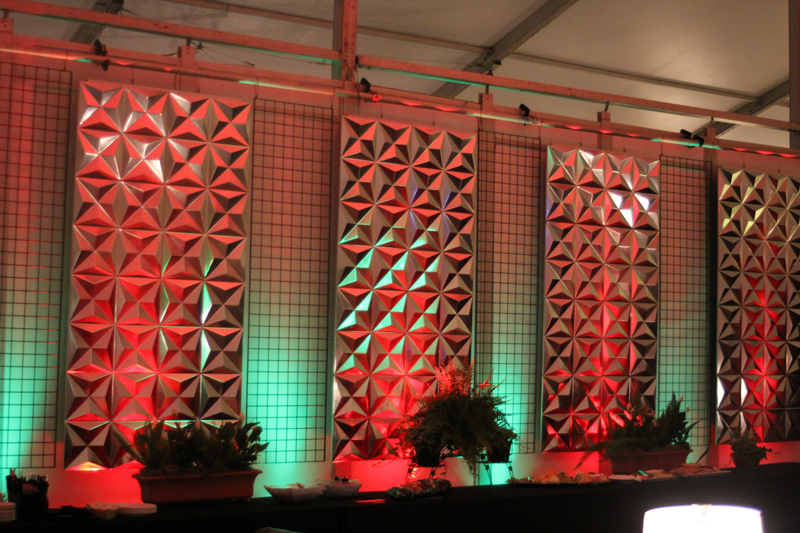 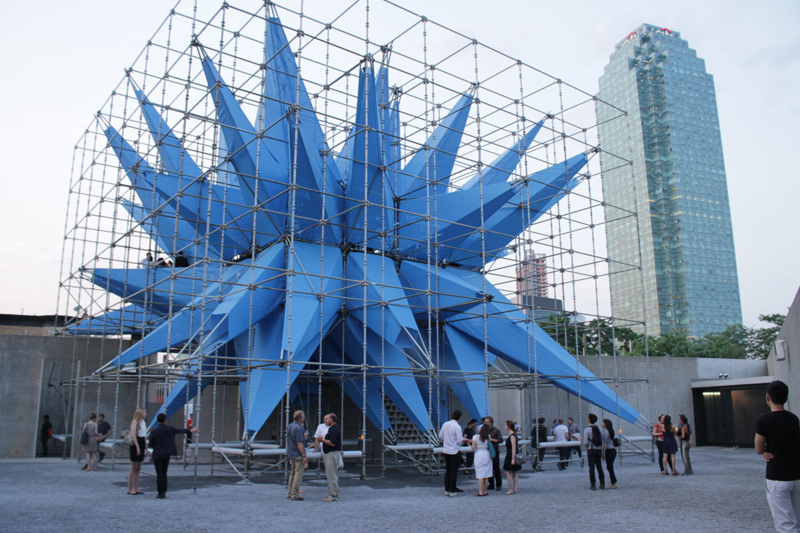 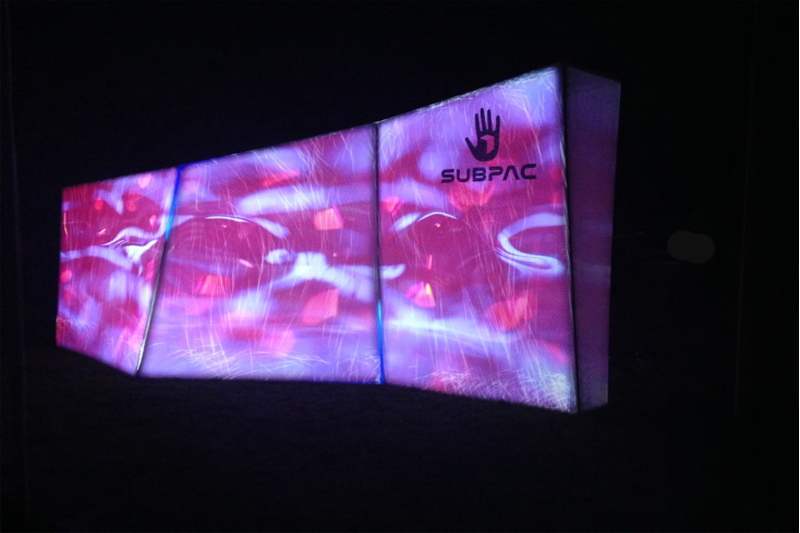 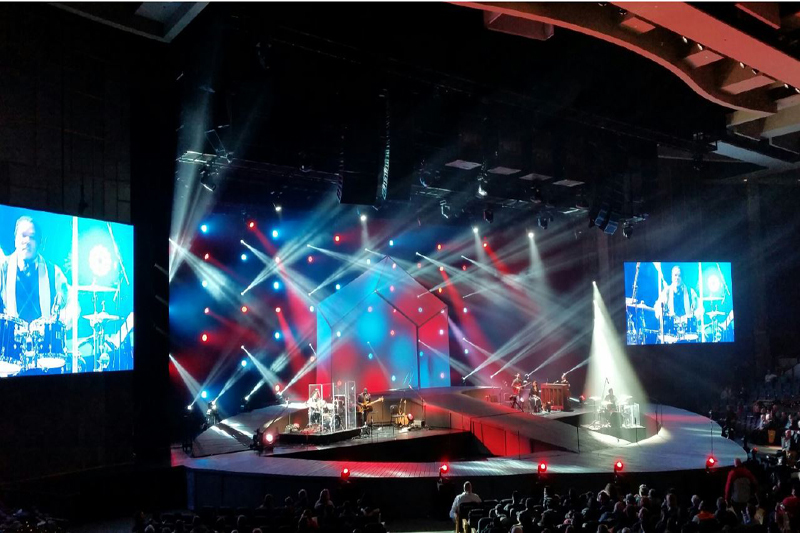 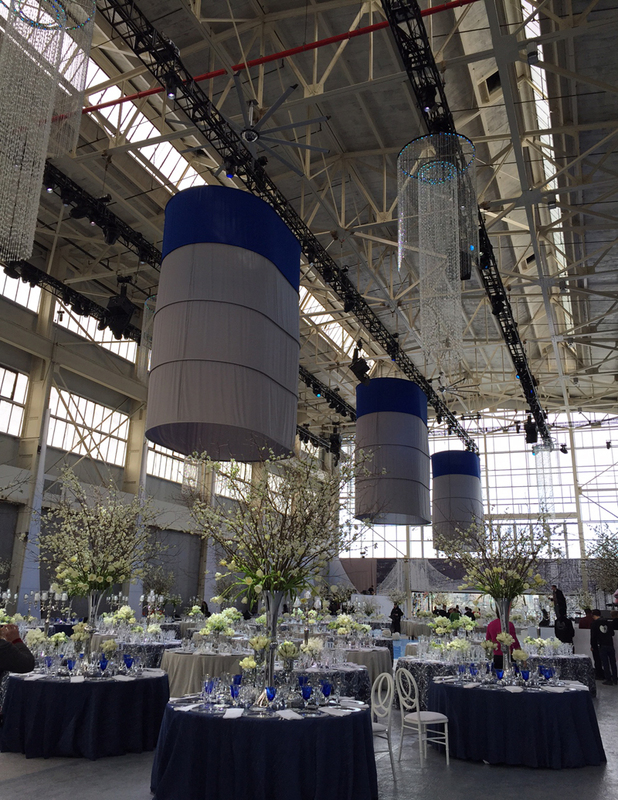 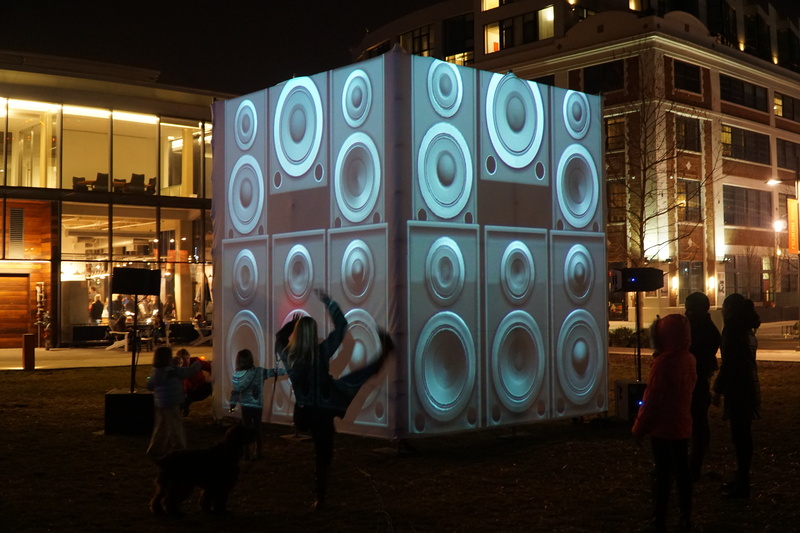 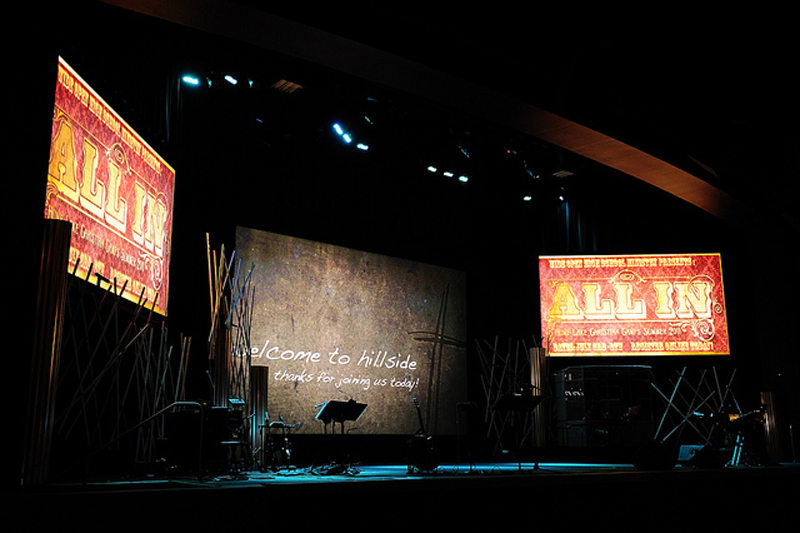 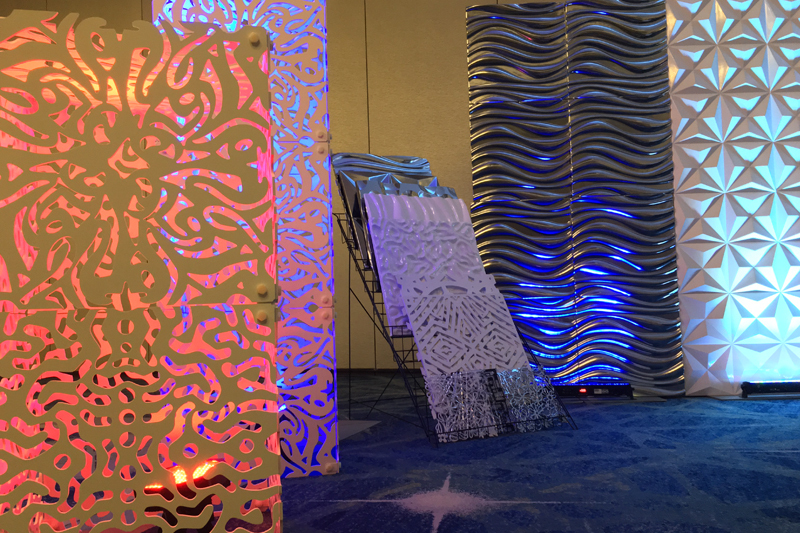 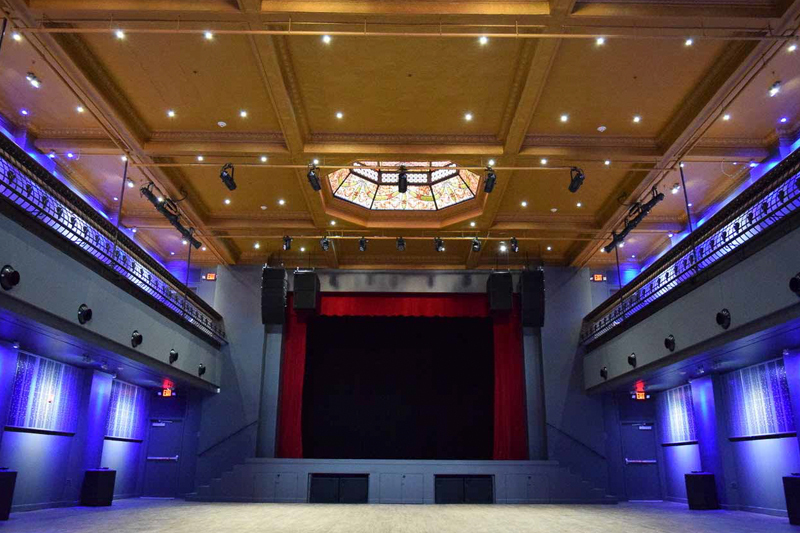 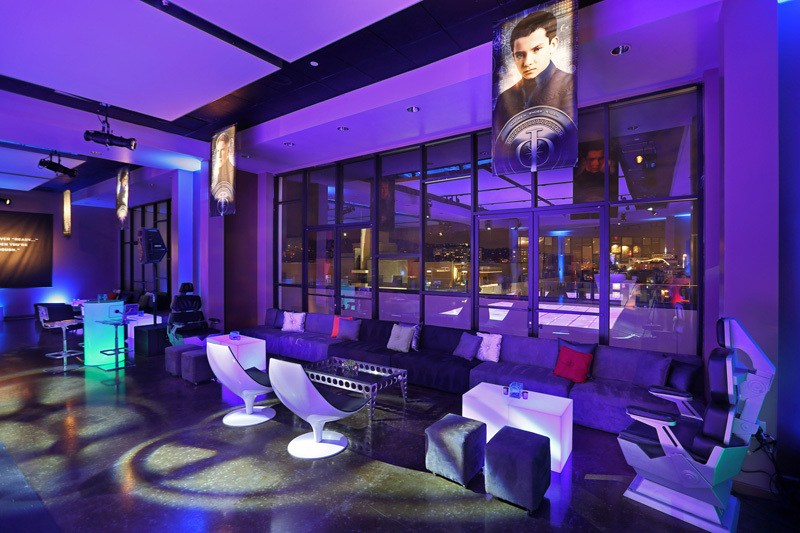 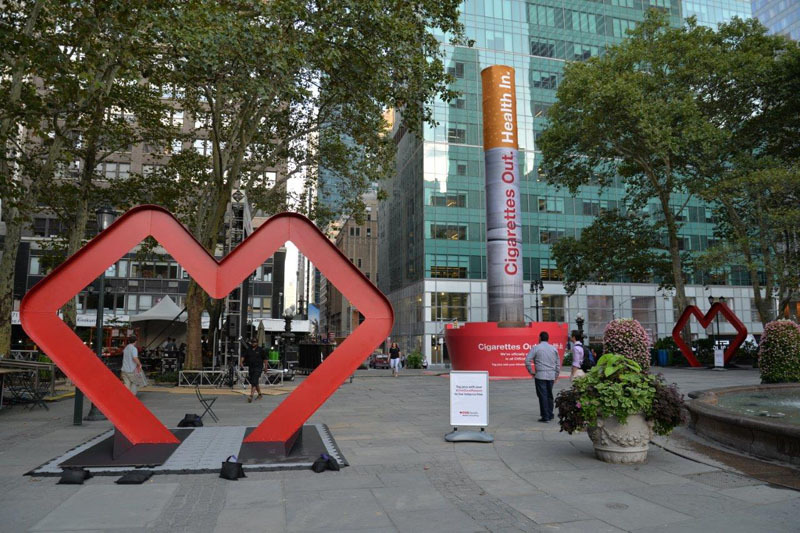 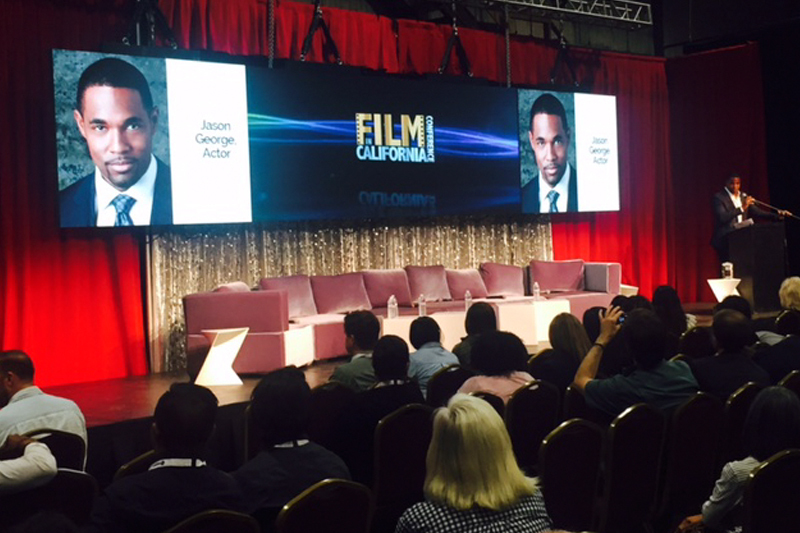 Custom fabrication art installation using Trapeze Plus with rear projection. 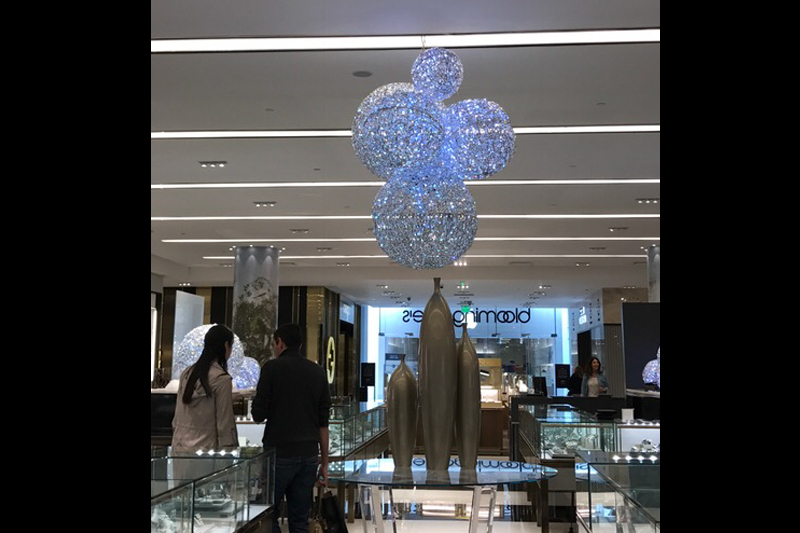 Harrods  London, UK. 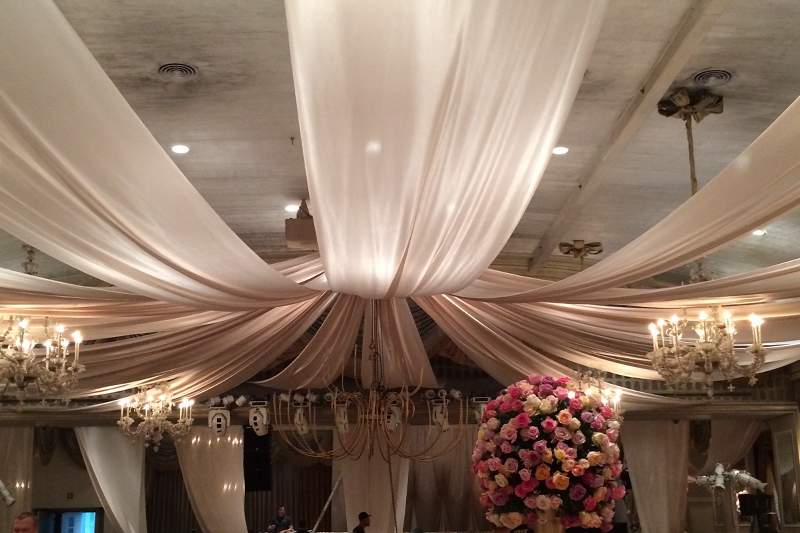 Whirlybird Floral Sheeting. 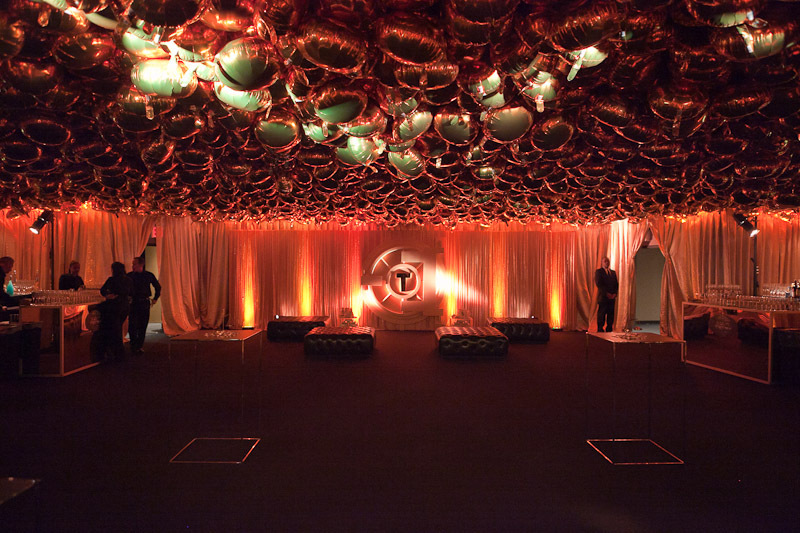 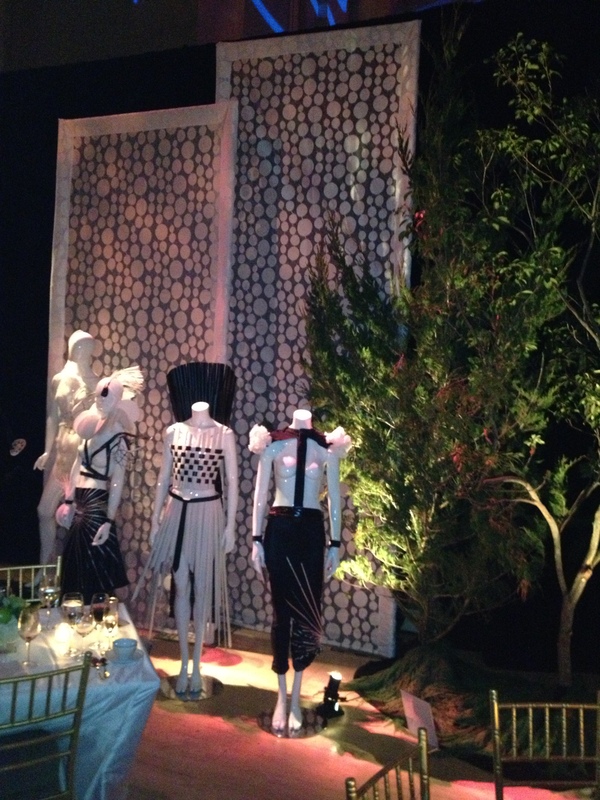 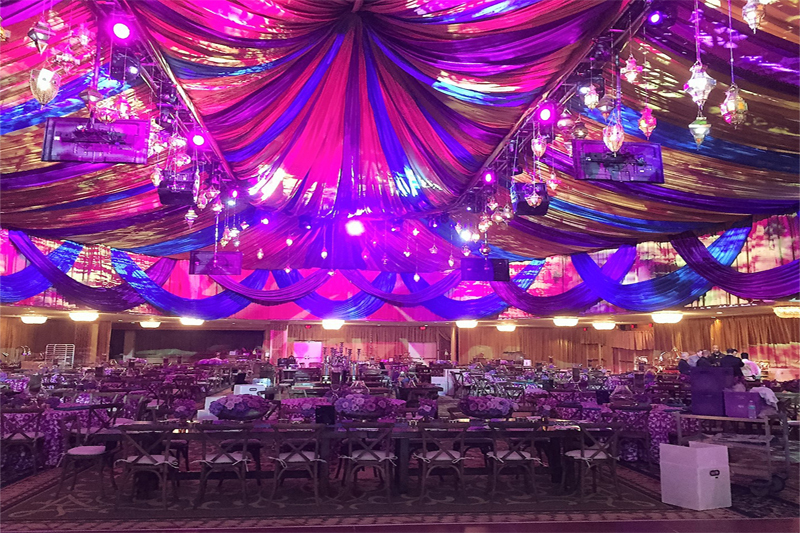 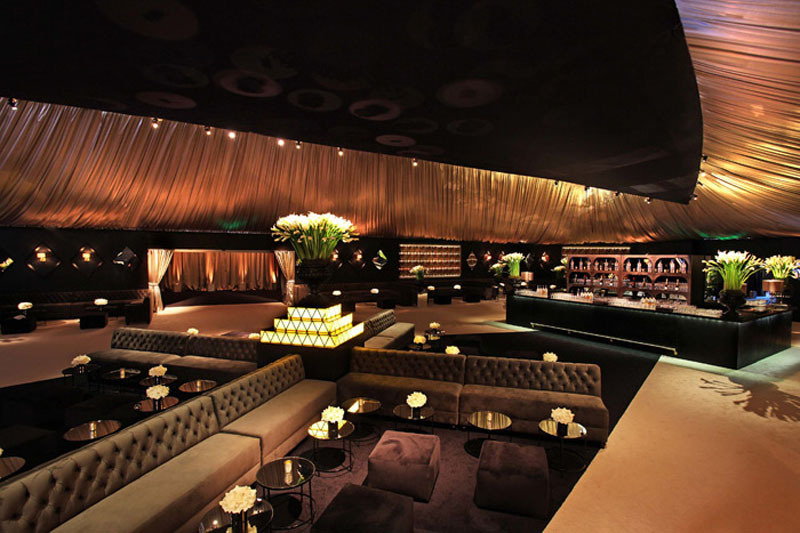 Custom fabrication, Brilliance, Circus.The Tourist After Party - Gotham Hall, NYC. 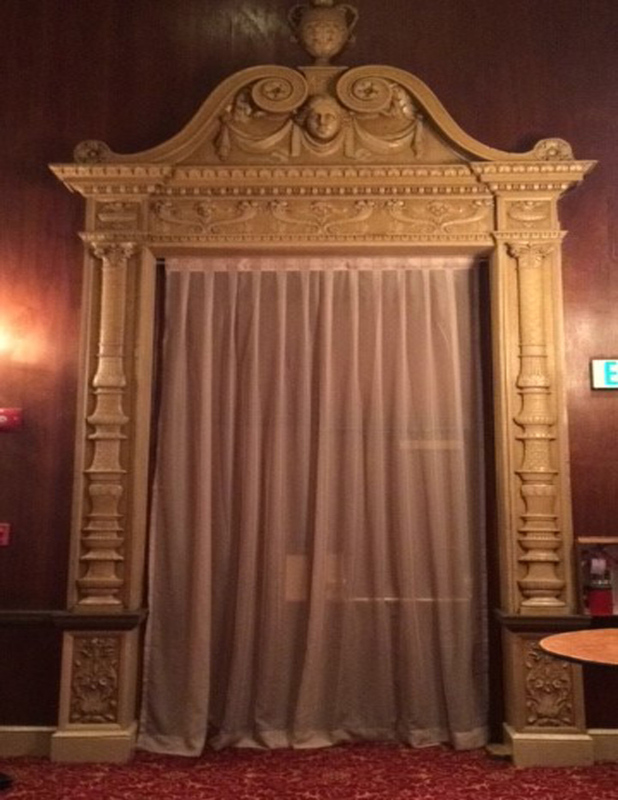 Stage Curtain - Milano Plus Velvet. 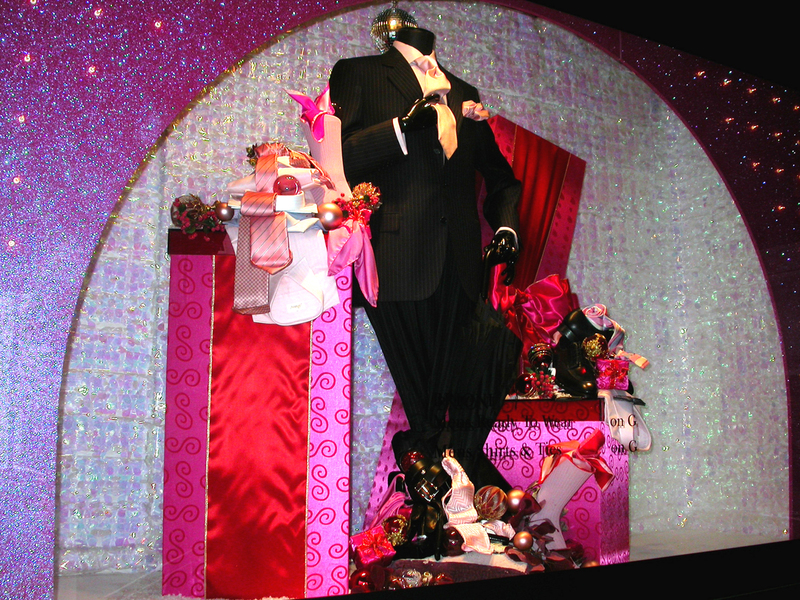 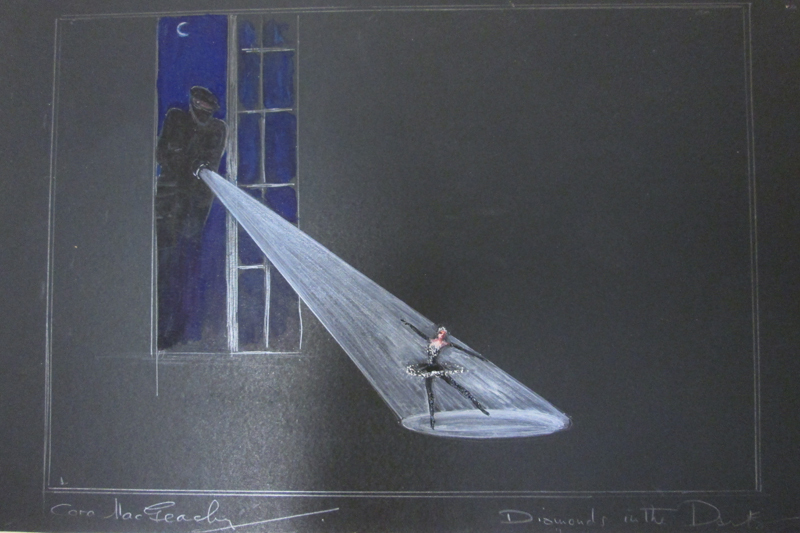 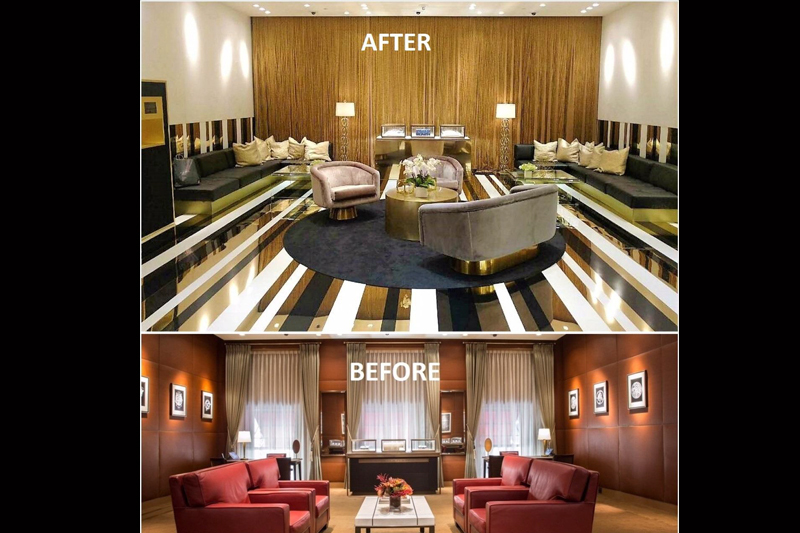 The Ellen ShowArt Direction: Jay Heiserman. 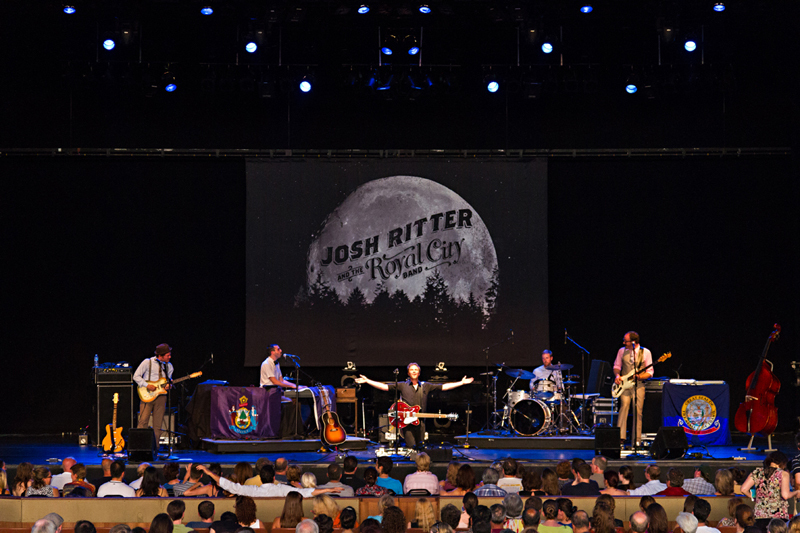 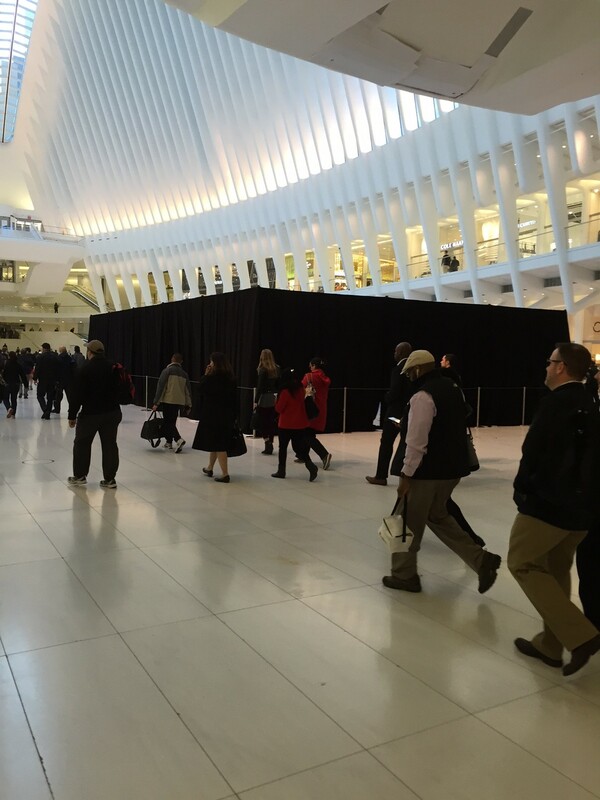 Photo Courtesy of Michael Rozman. 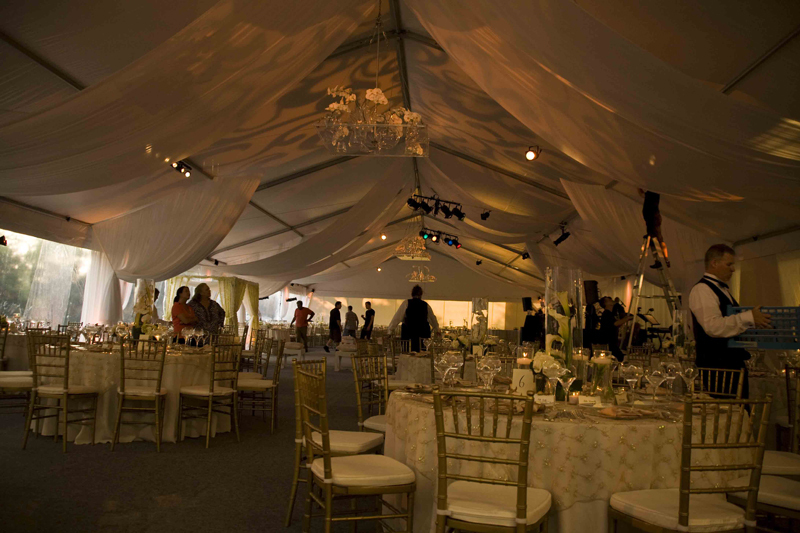 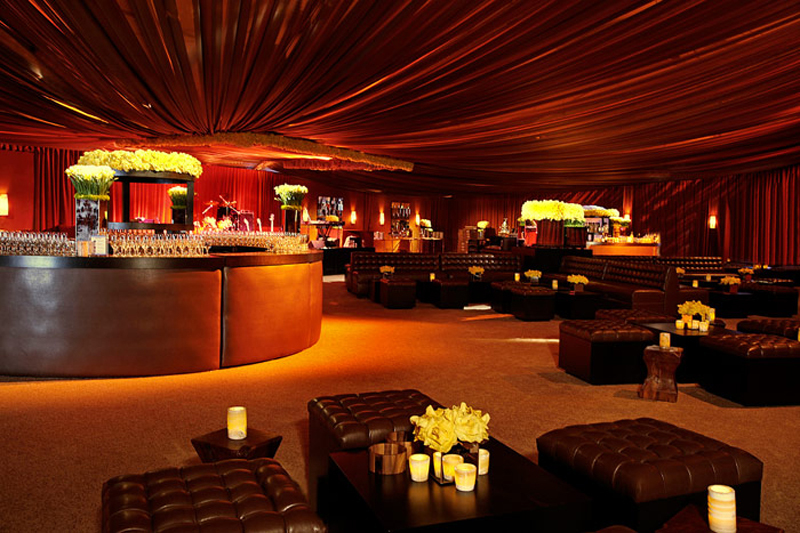 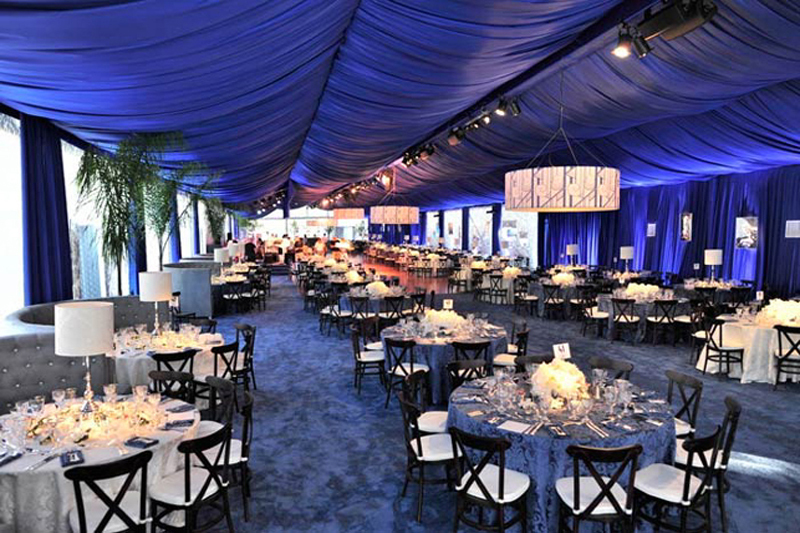 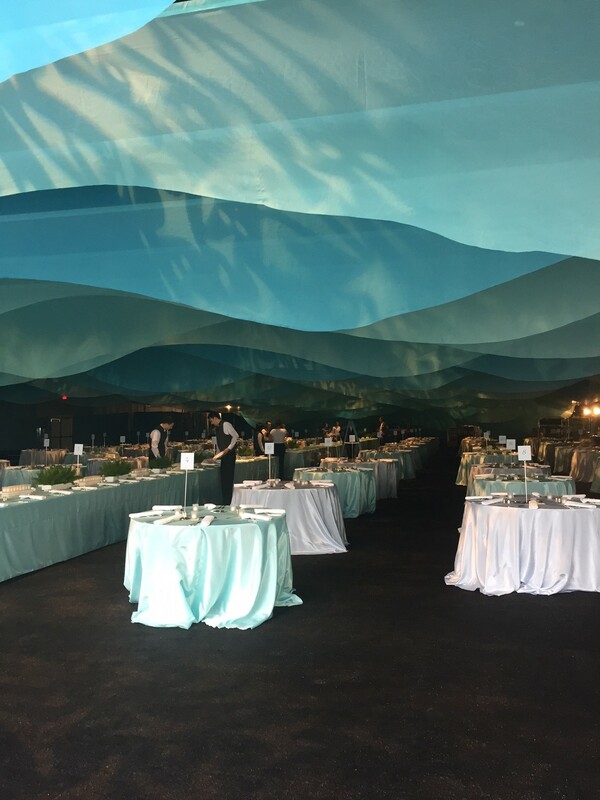 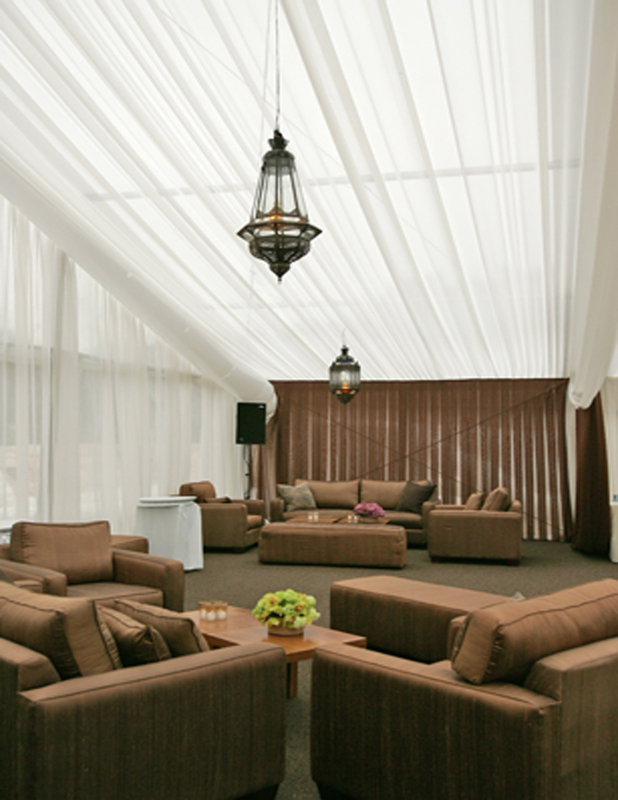 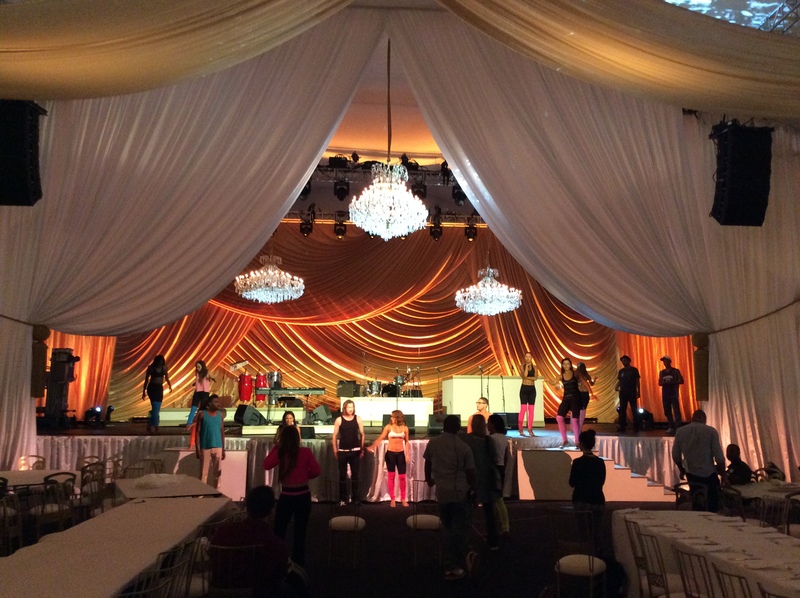 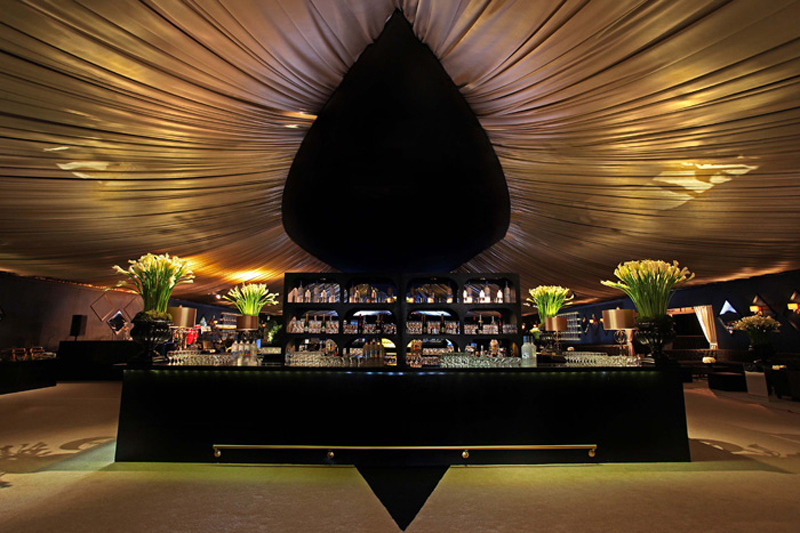 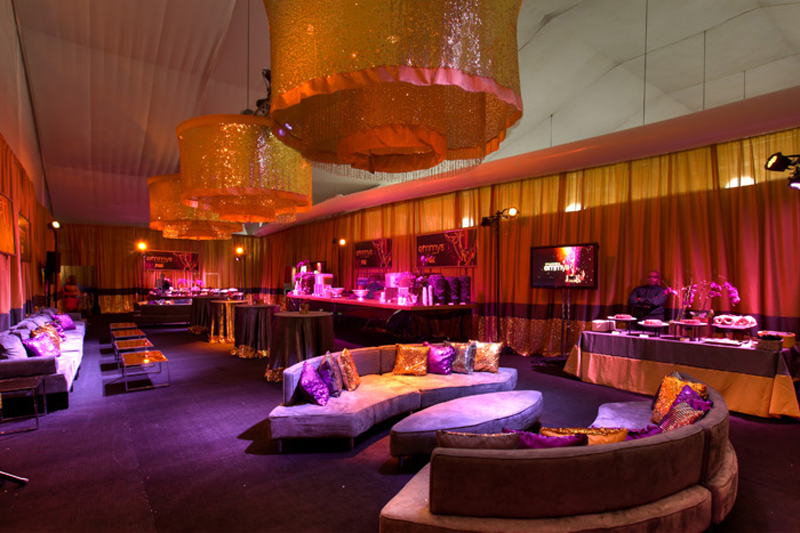 Custom Gold Draping for the Children's Hospital LA event. 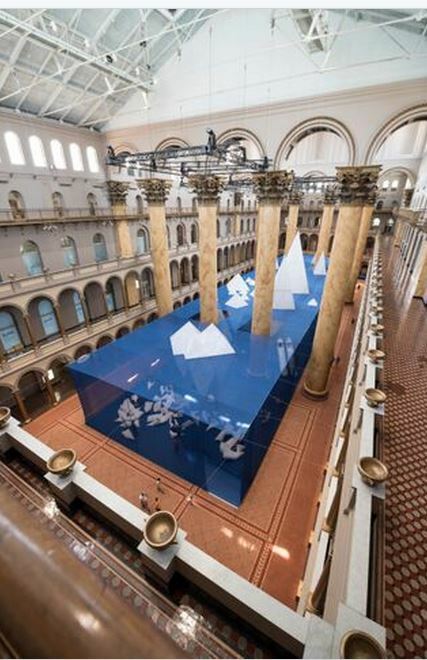 Icebergs the Exhibit at the National Building Museum in Washington DC features Suppression Mesh that was dyed blue and suspended by aircraft cable. 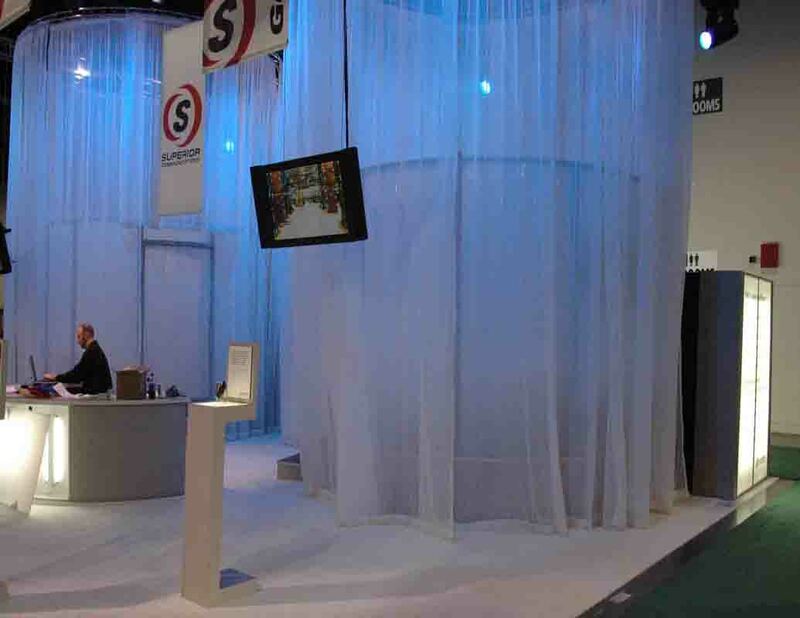 The mesh was used to create the entire perimeter of the exhibit. 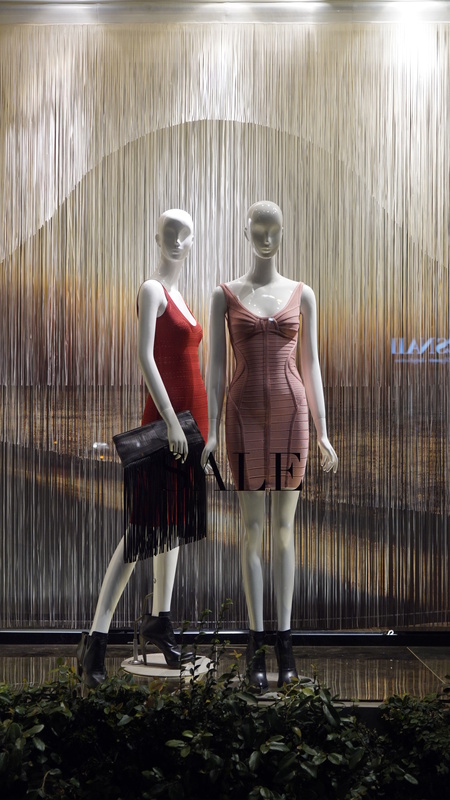 Herve Leger in West Hollywood. 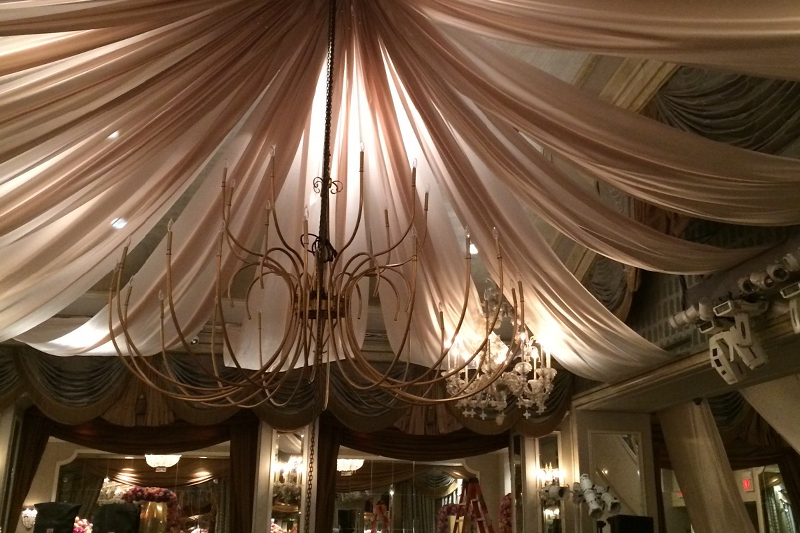 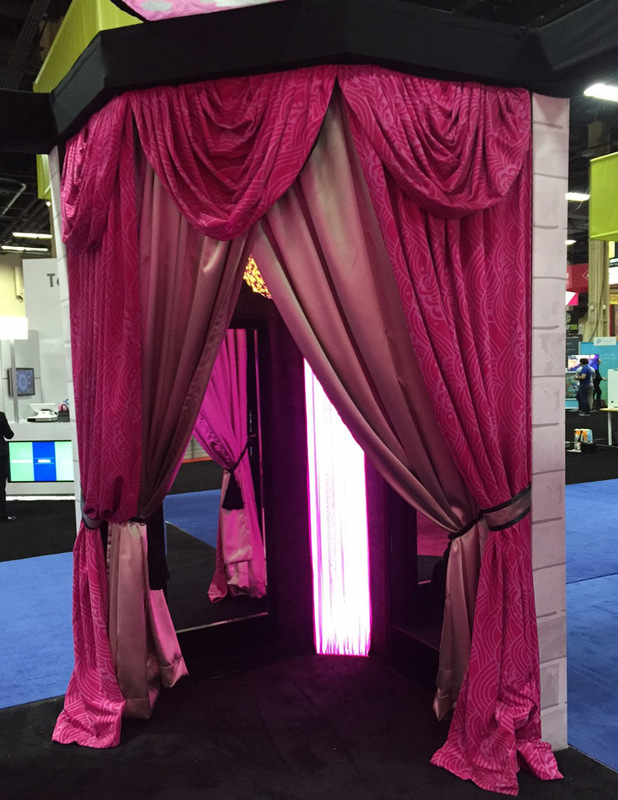 Custom Printed String Curtains. 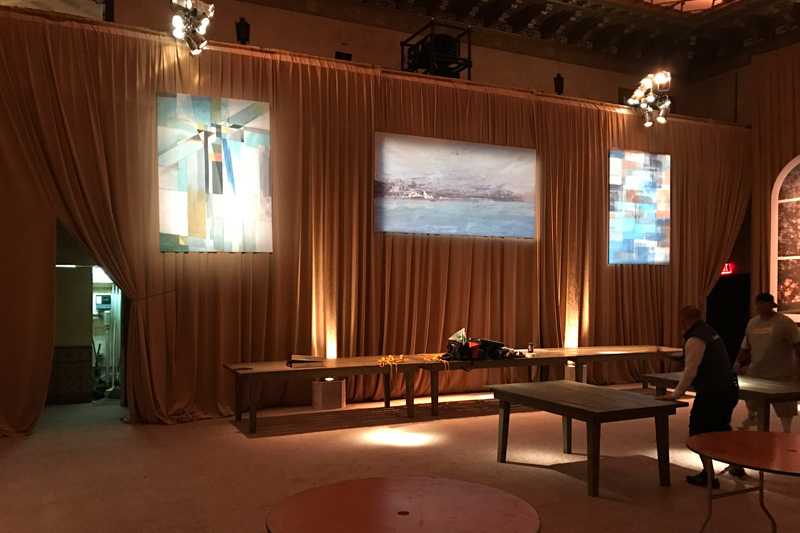 Alchemy - Gold Fabricated/Rental drapes used for the opening scene for a movie called ‘WHAT NOW’ Used for masking, 16’h x 10’w / 16’h x 5’w. 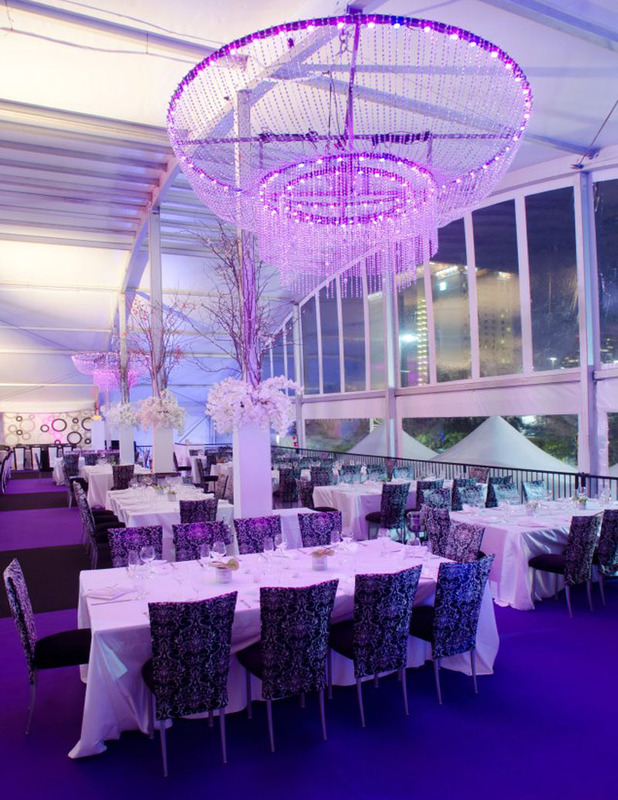 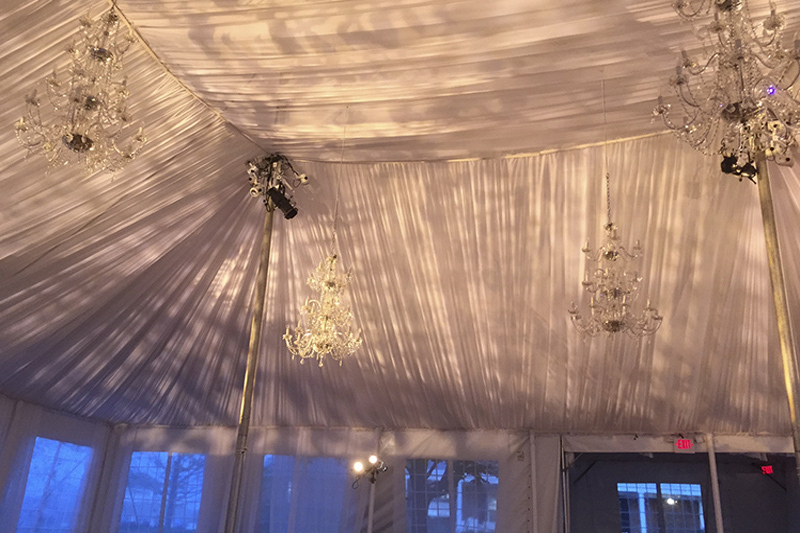 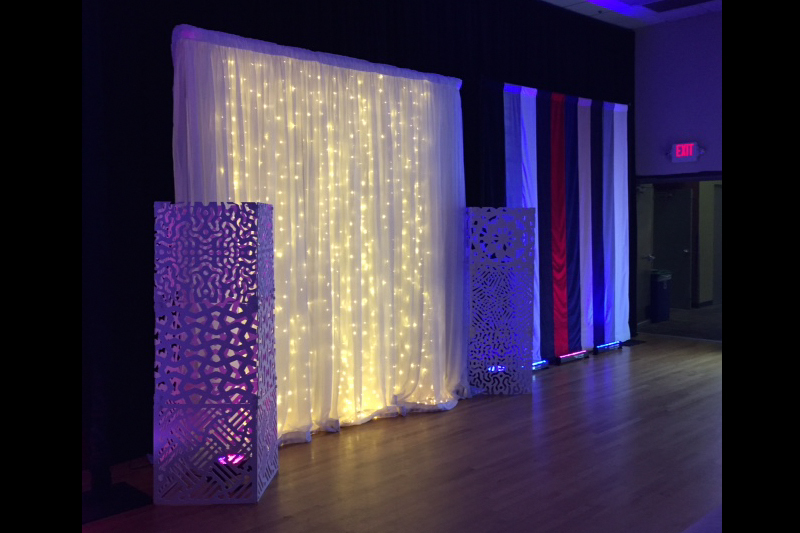 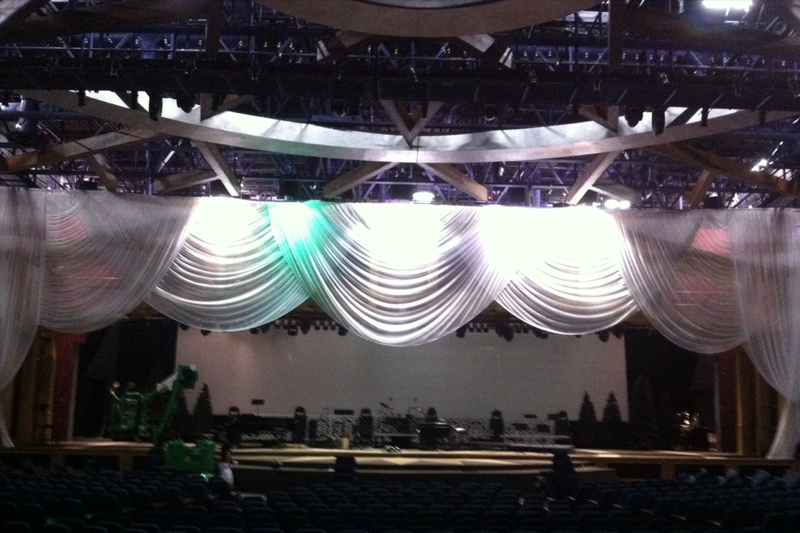 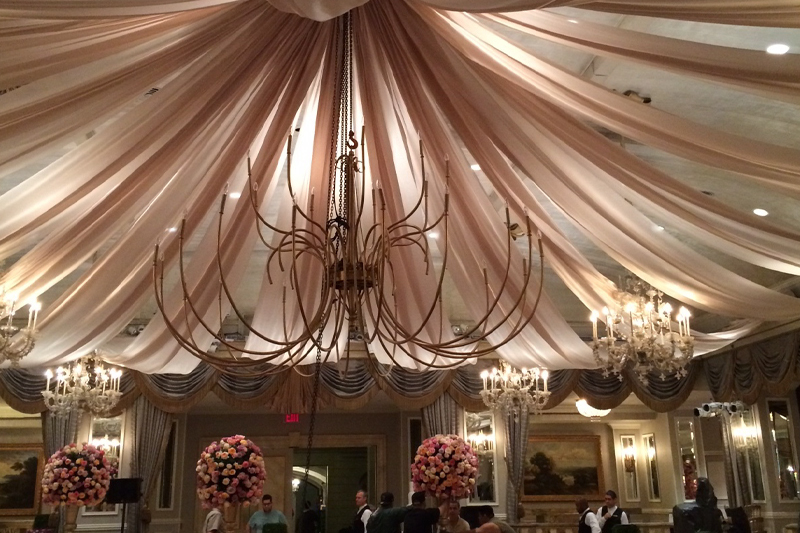 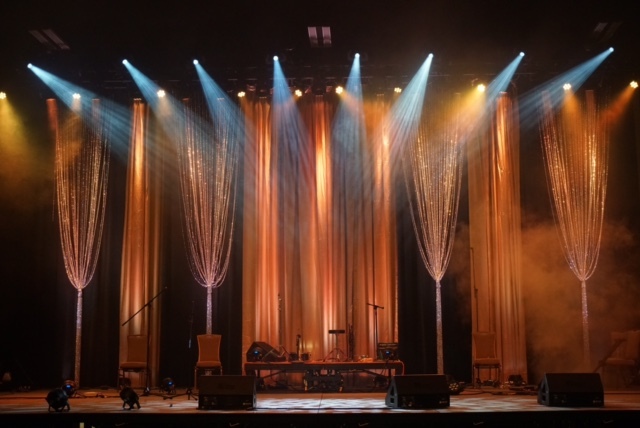 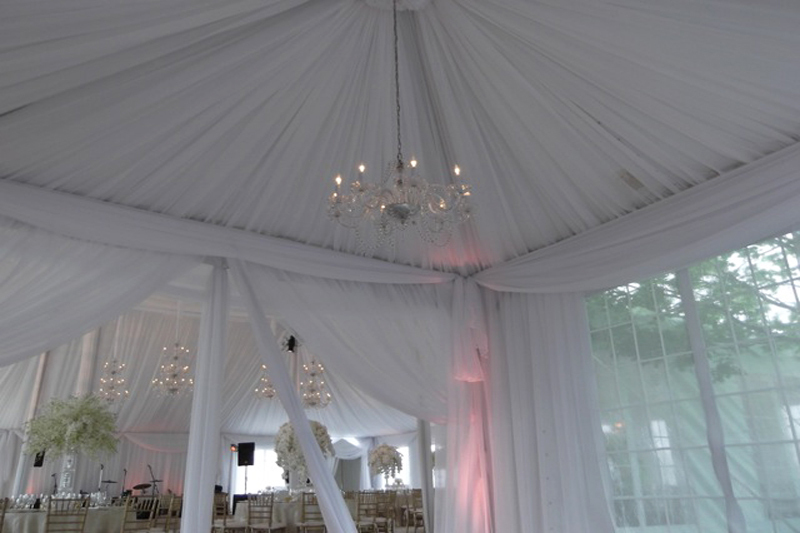 Silver round bead curtain cages and stage curtains. 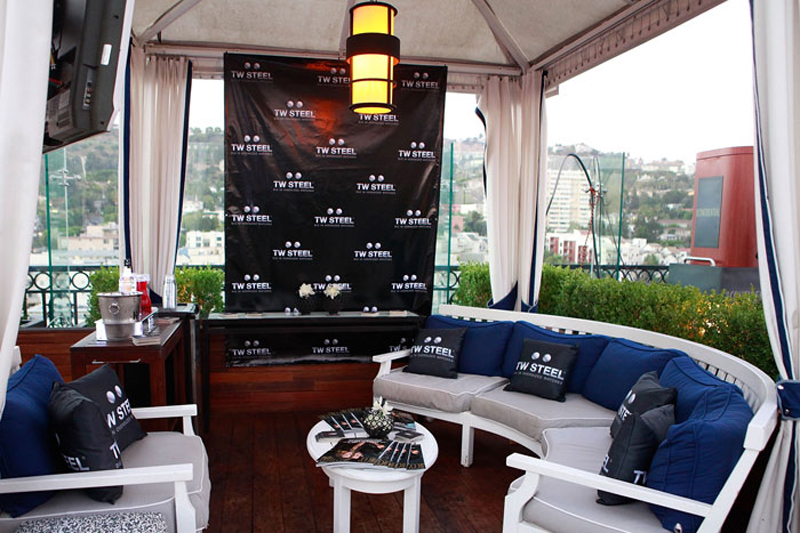 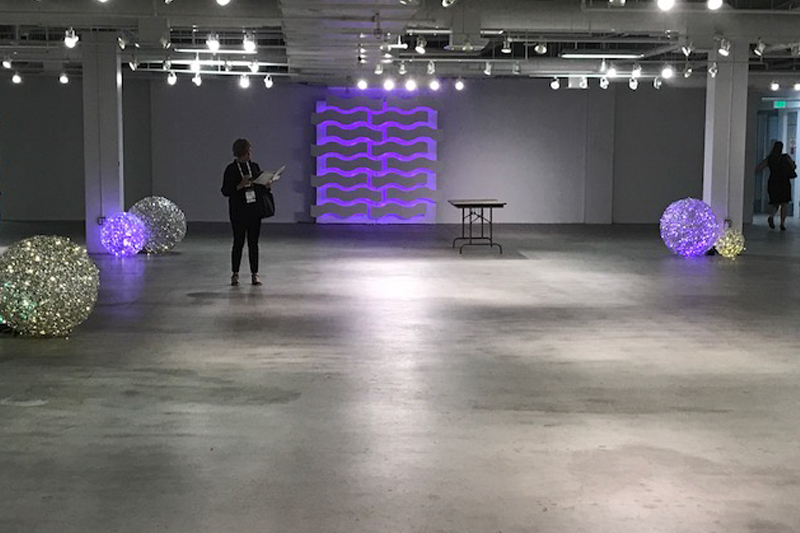 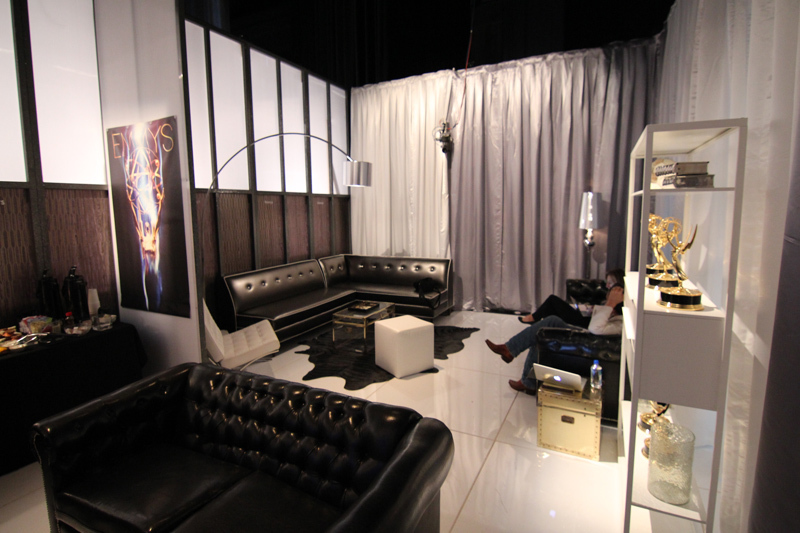 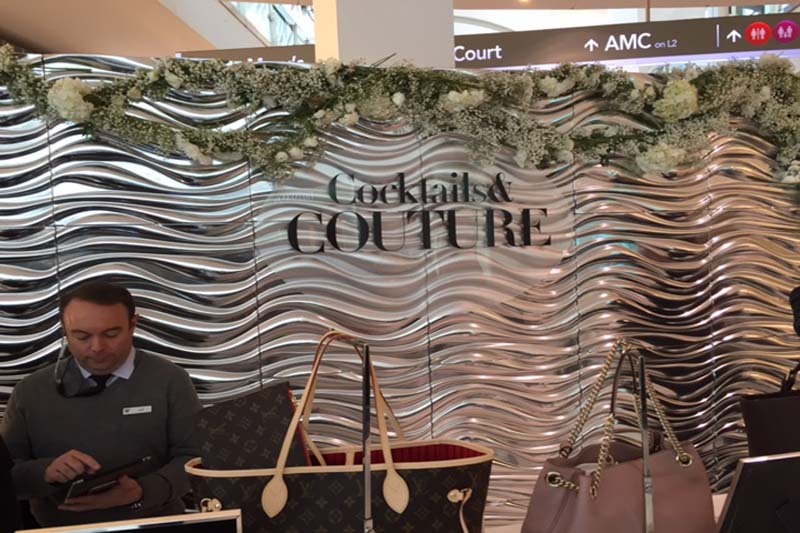 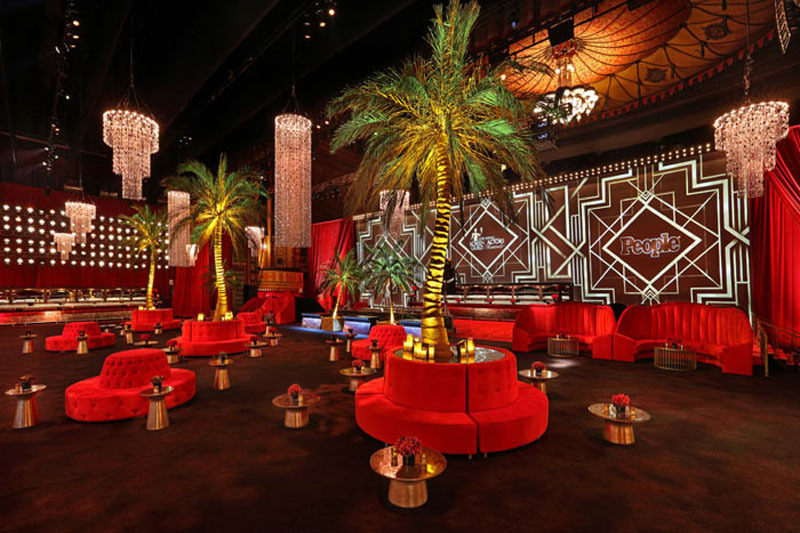 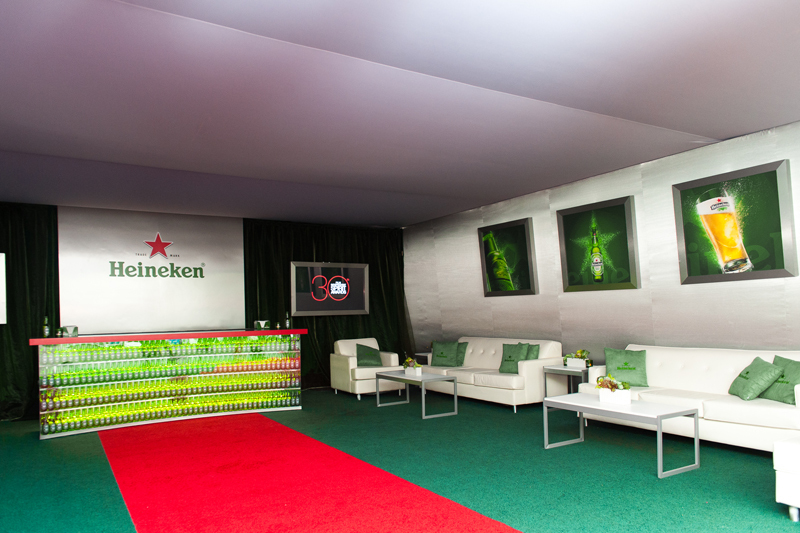 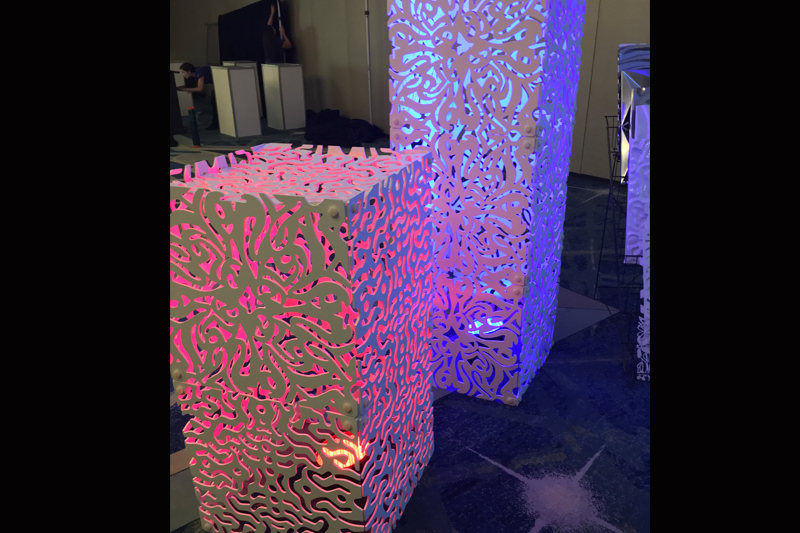 2016 LA Fashion Week lounge with a perimeter created from Vector HD Tiles in Chrome Surf. 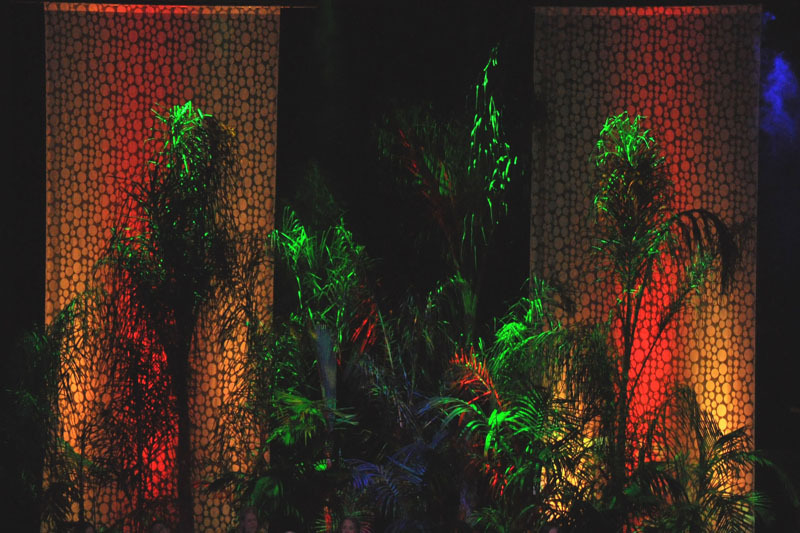 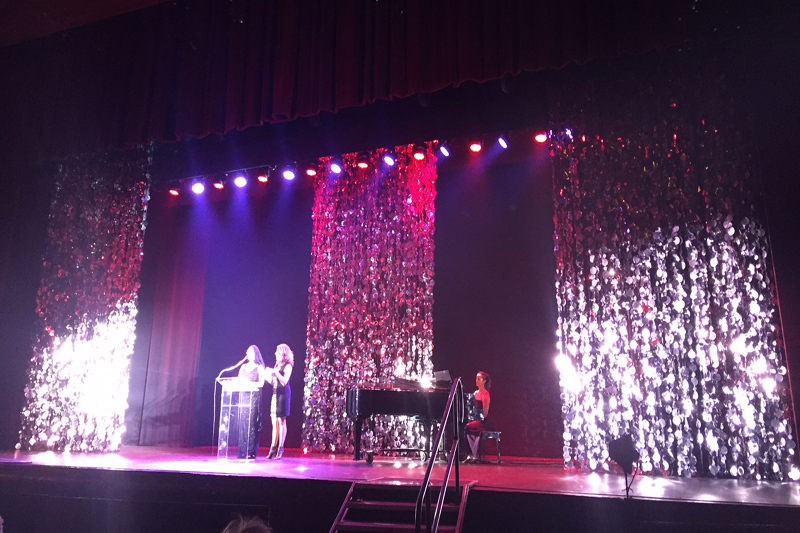 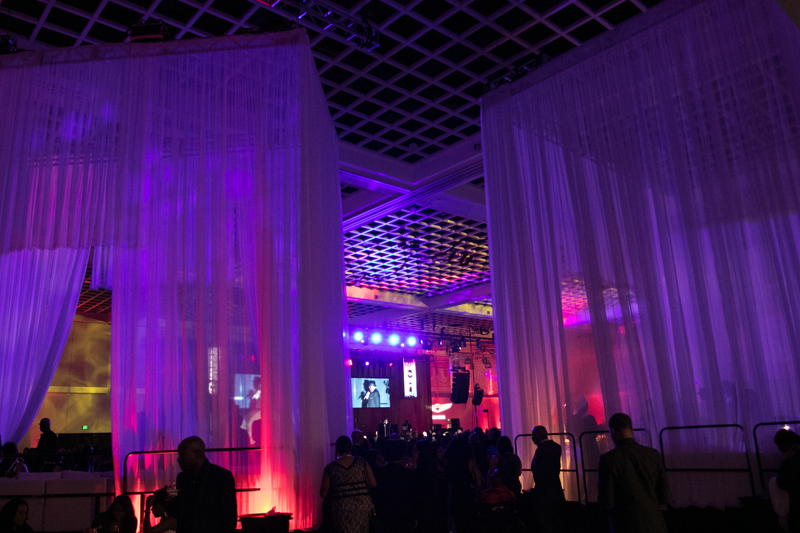 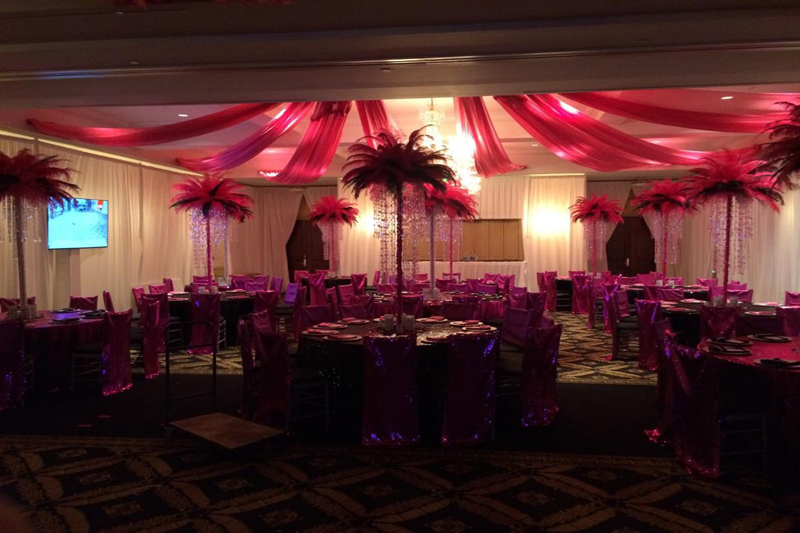 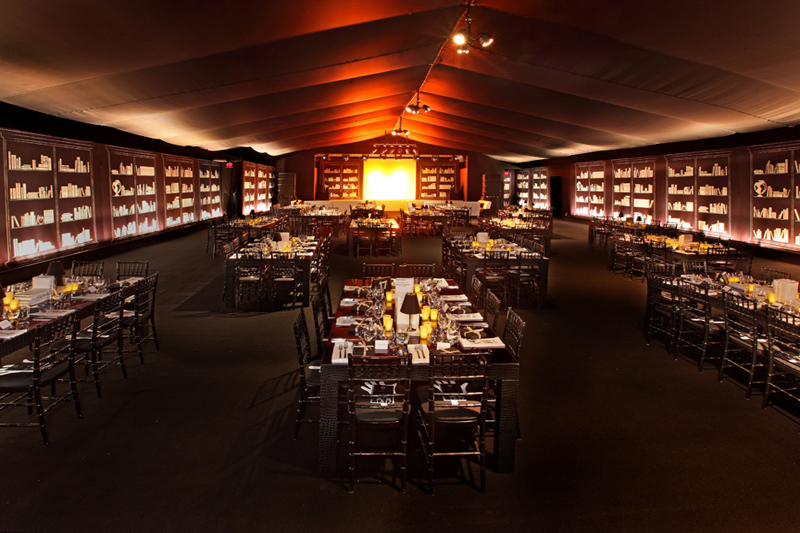 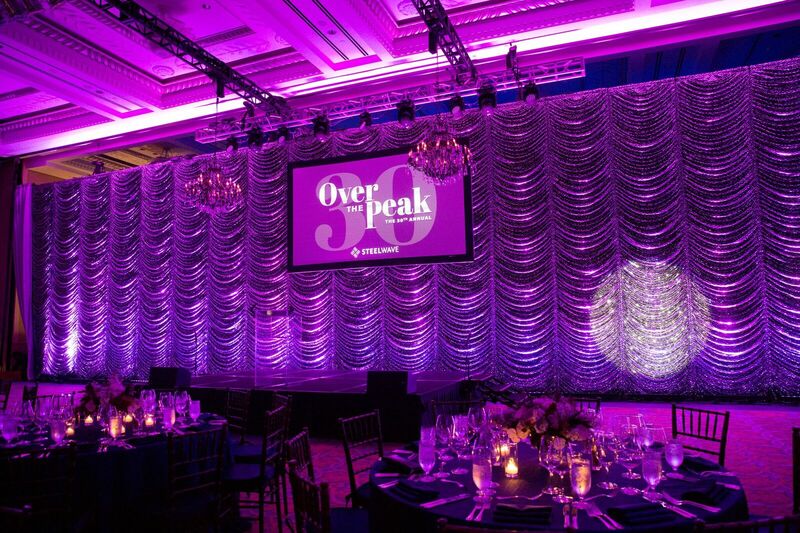 Pewter/Black Molten Lava Stage Curtain.MPI Annual Dinner - Pembroke Pines, FL. 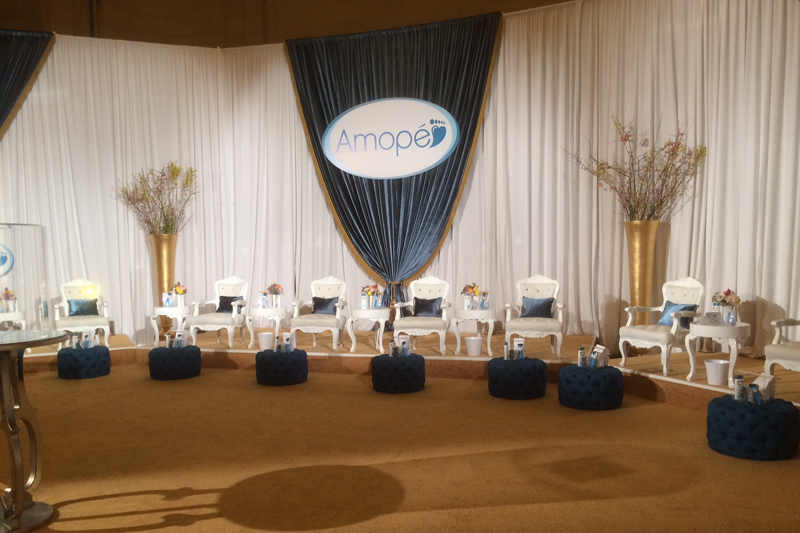 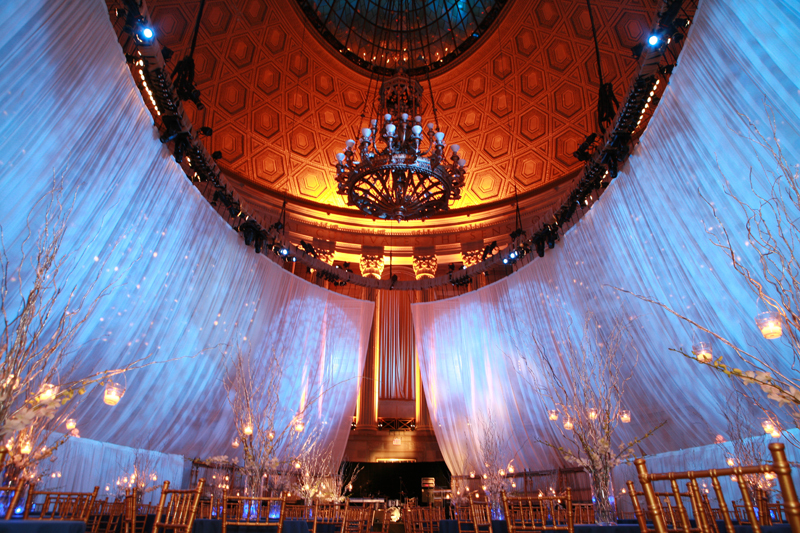 Masking Drapery - Rental -Amopé Product Launch - Abel McCallister - Grand Central Station. 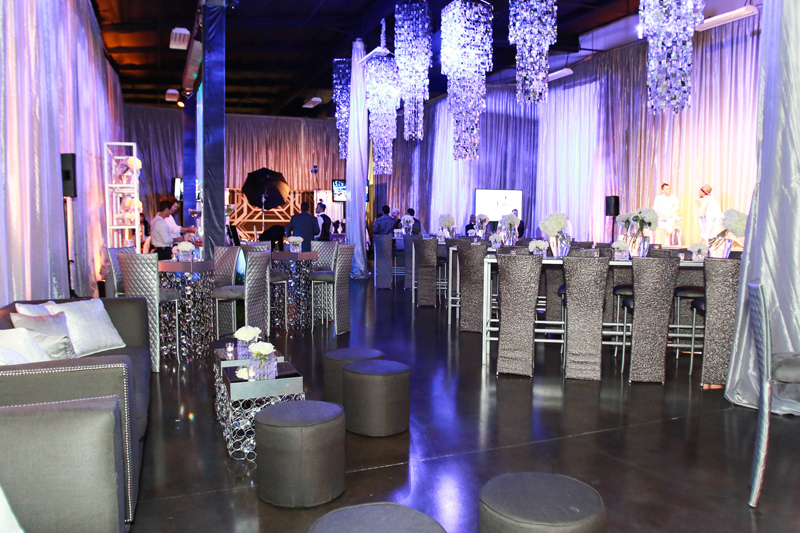 Corporate event featuring Austrian Zips Modulars in Silver Black Spangle Mesh. 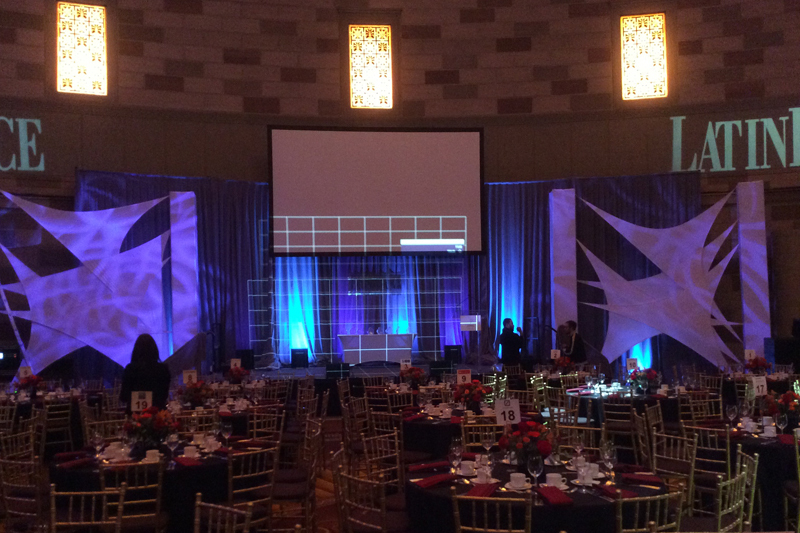 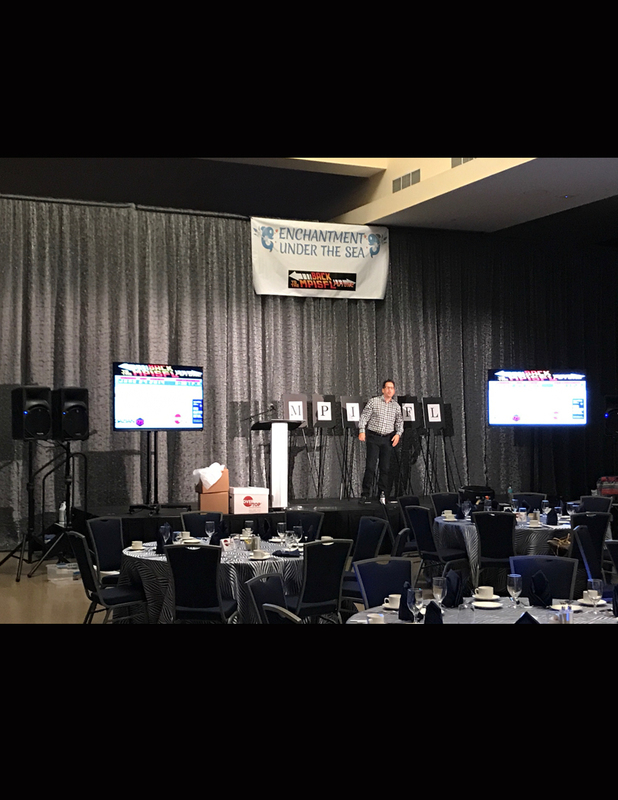 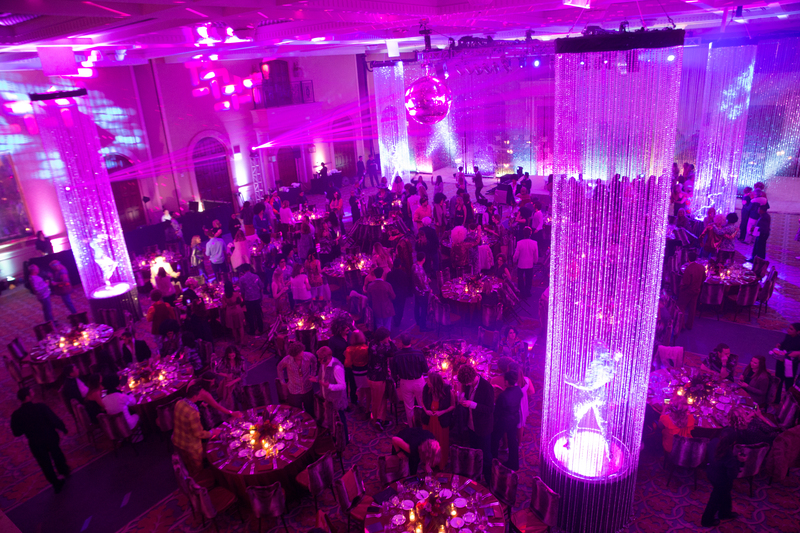 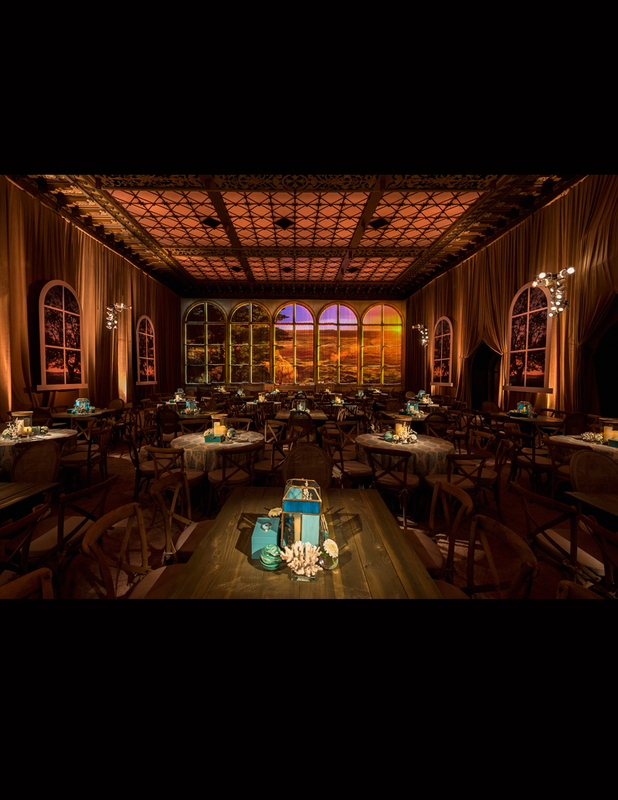 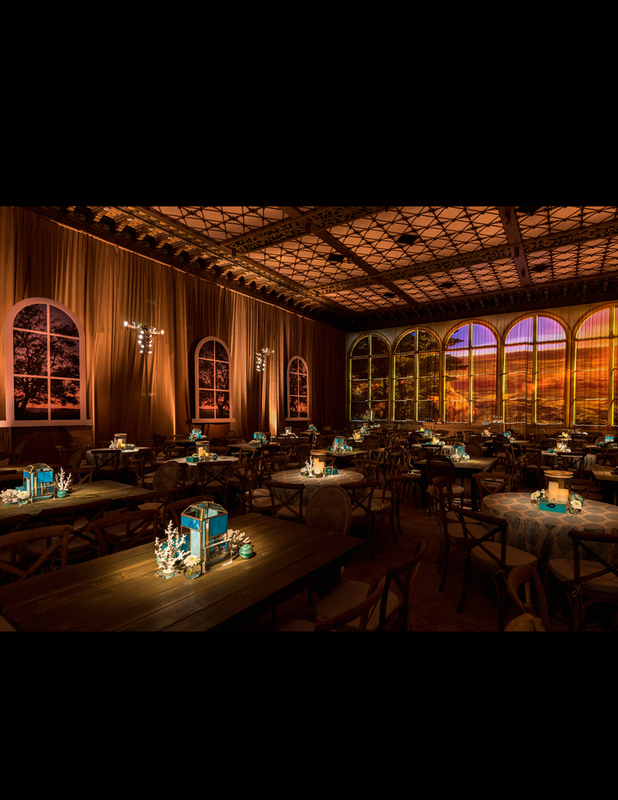 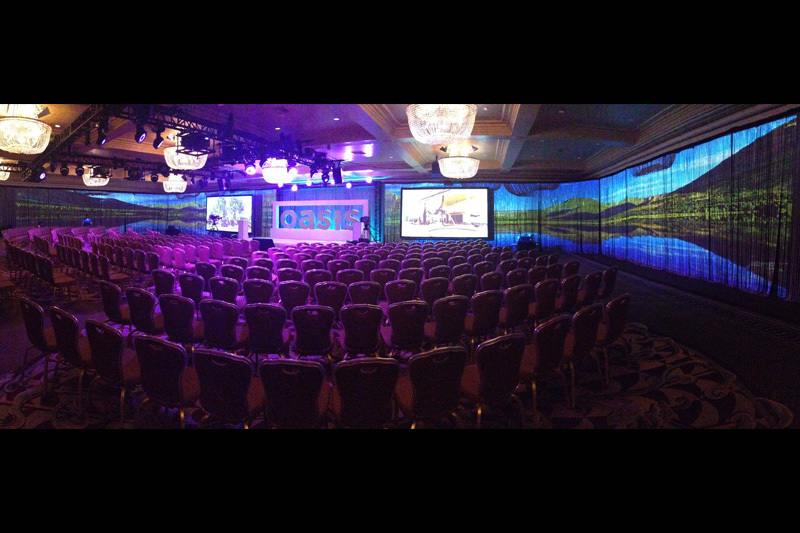 Projection mapping onto Chromalink Chain for an event at the Fairmont Hotel in Santa Monica, CA. 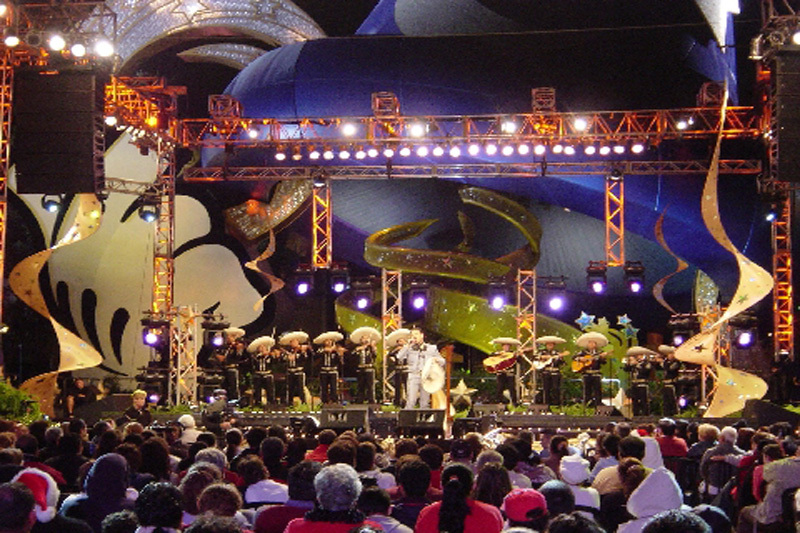 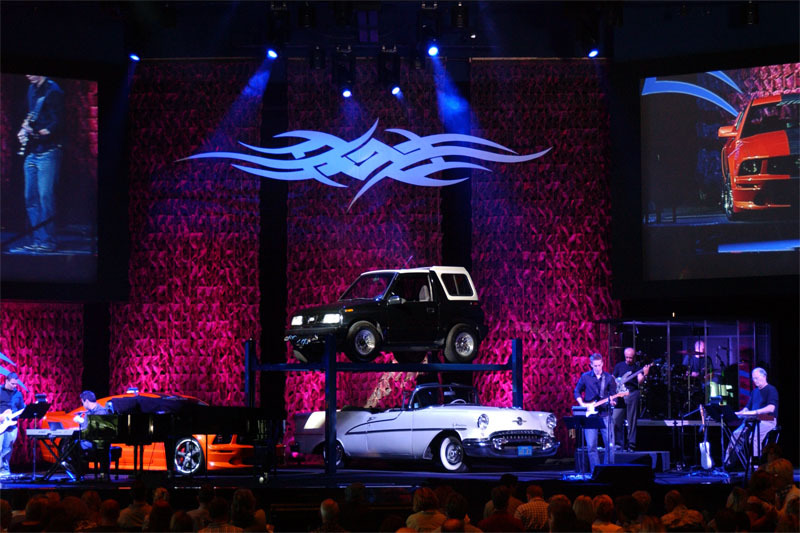 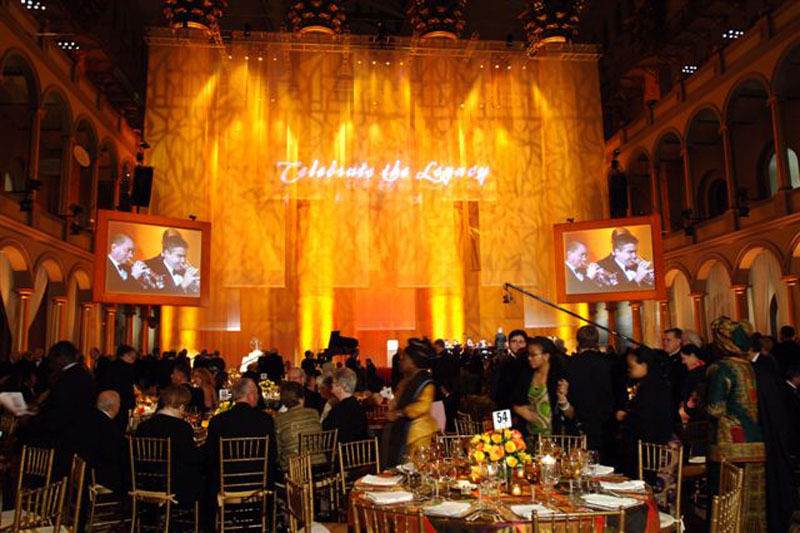 Micron Mesh, Projection.“Celebrating The Legacy of Pope John Paul”Photo courtesy of Hargrove, Inc. 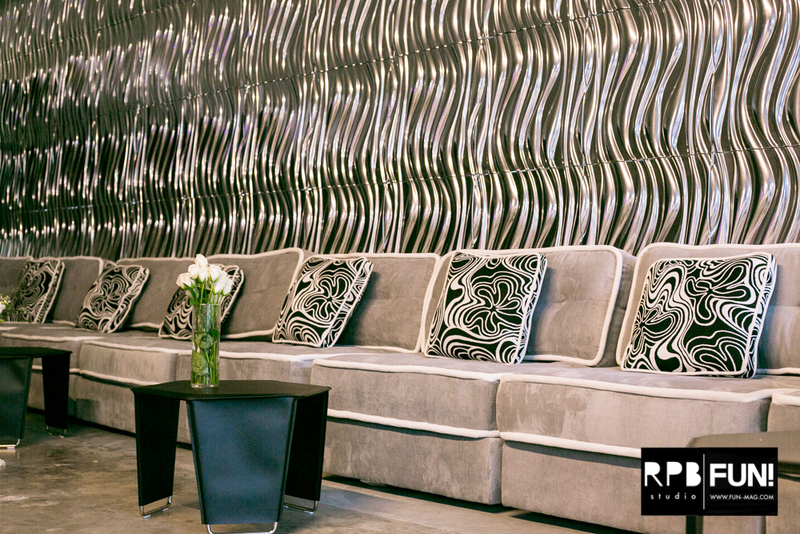 Custom Fabrication. 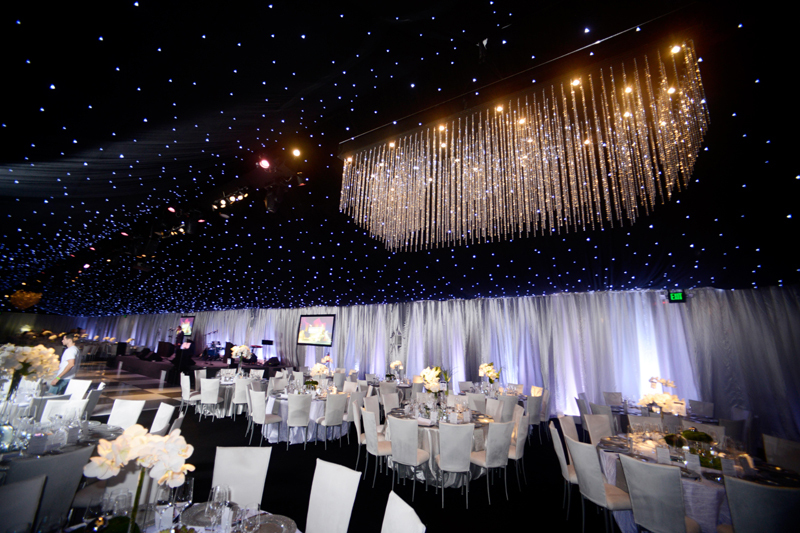 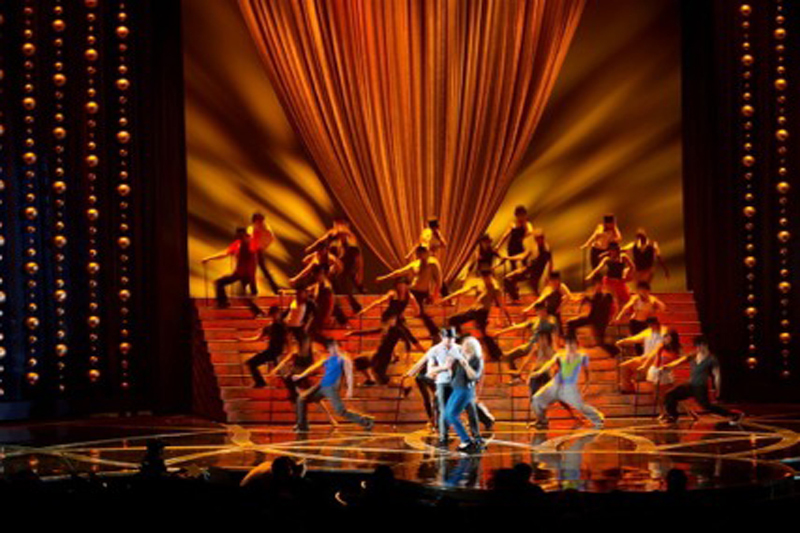 58th Annual Grammy Awards - Angel City DesignsSean Twomey/2me Studios photography. 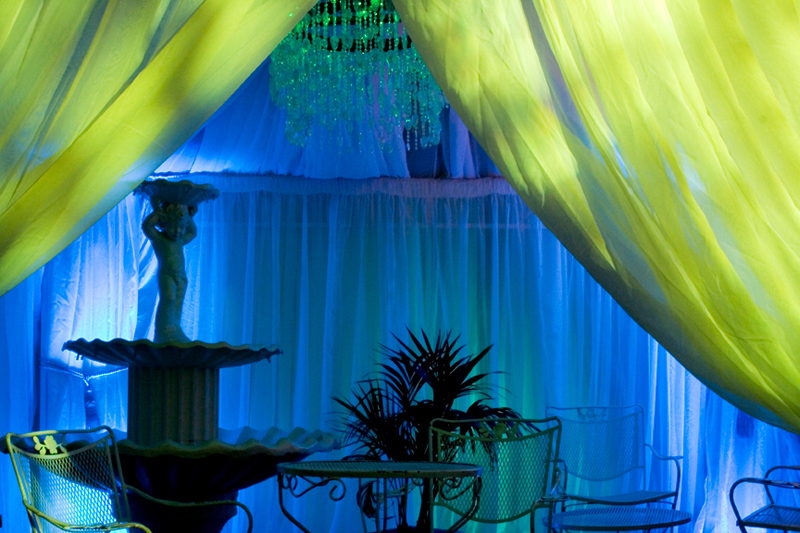 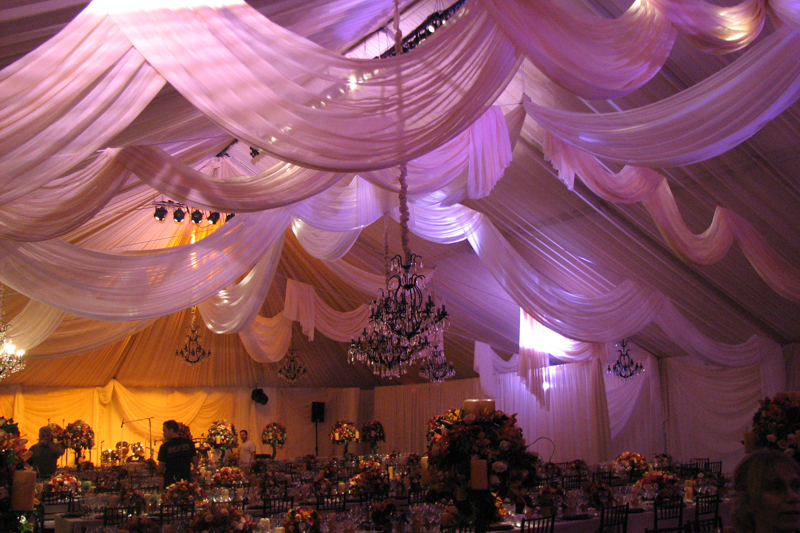 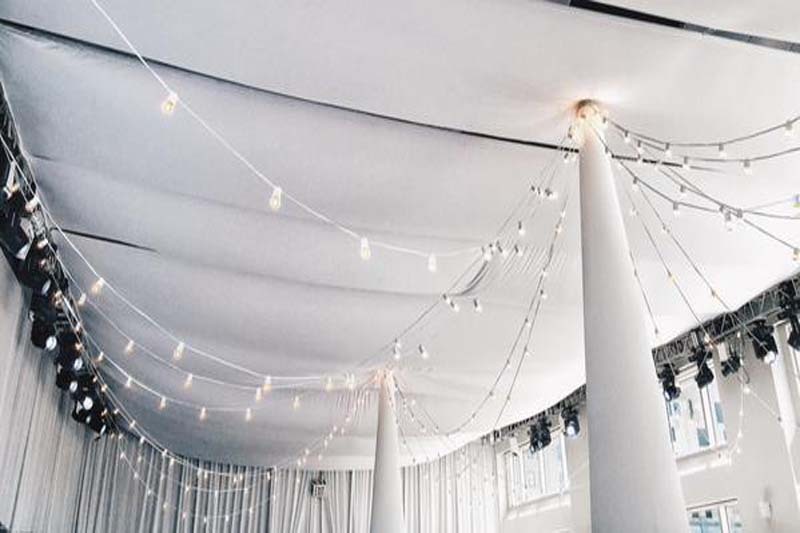 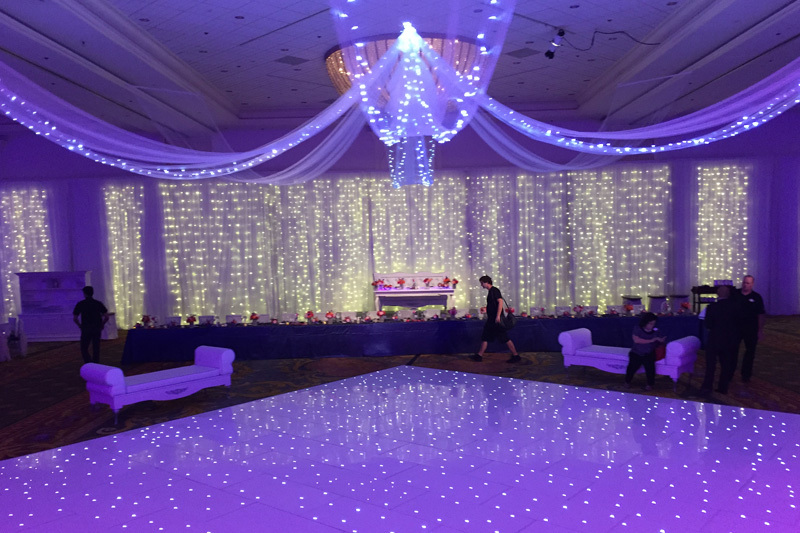 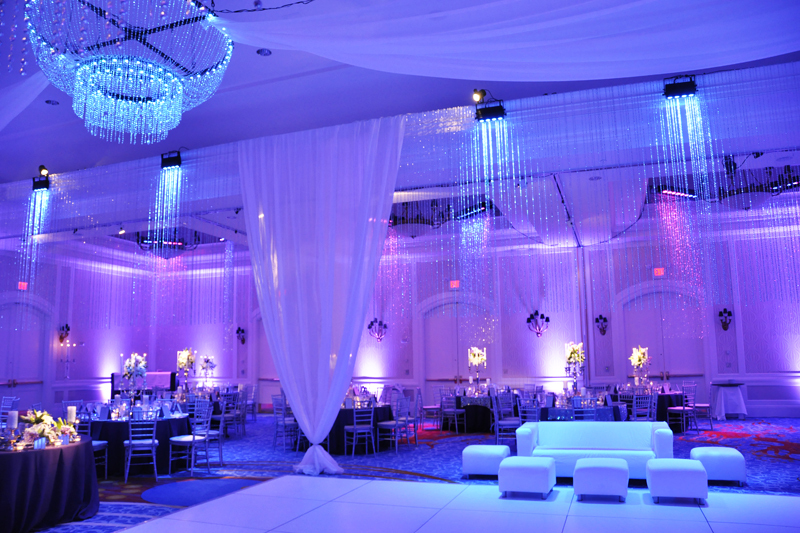 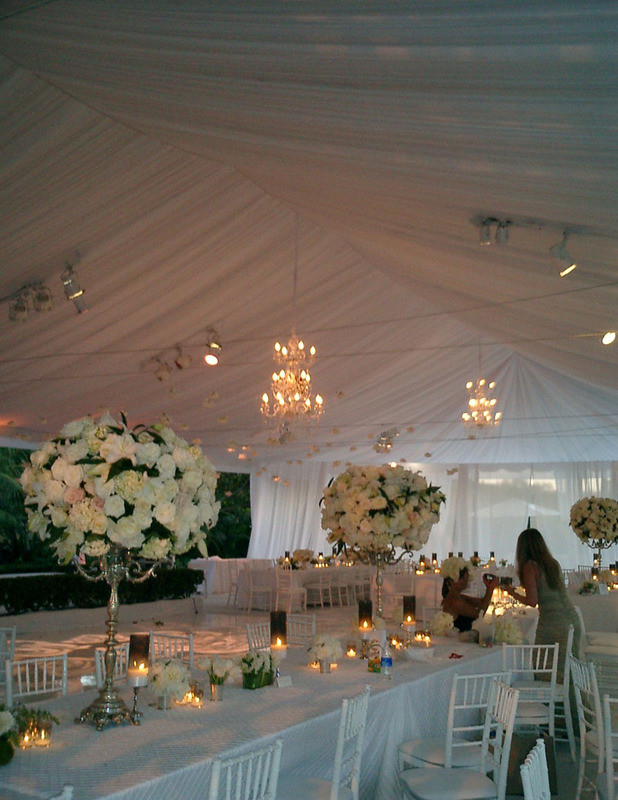 Wedding Lightscape with white masking drapery and NuVoile swags with string lights. 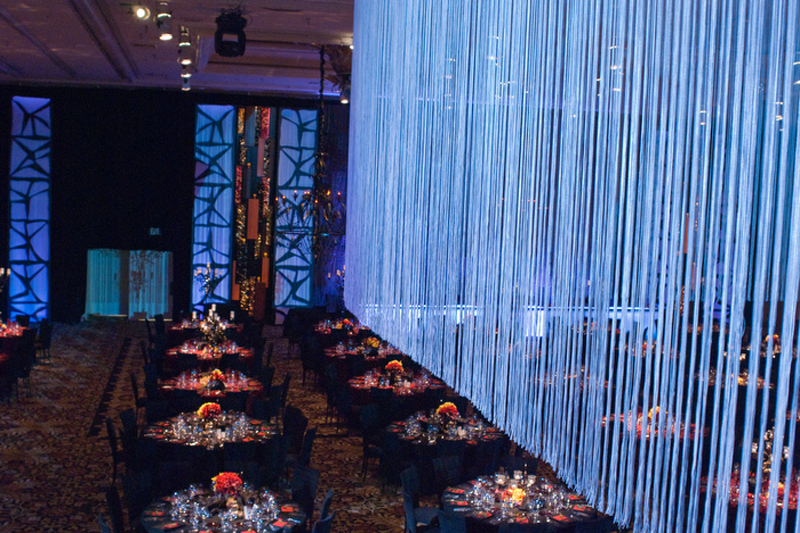 Custom Bead Curtain. 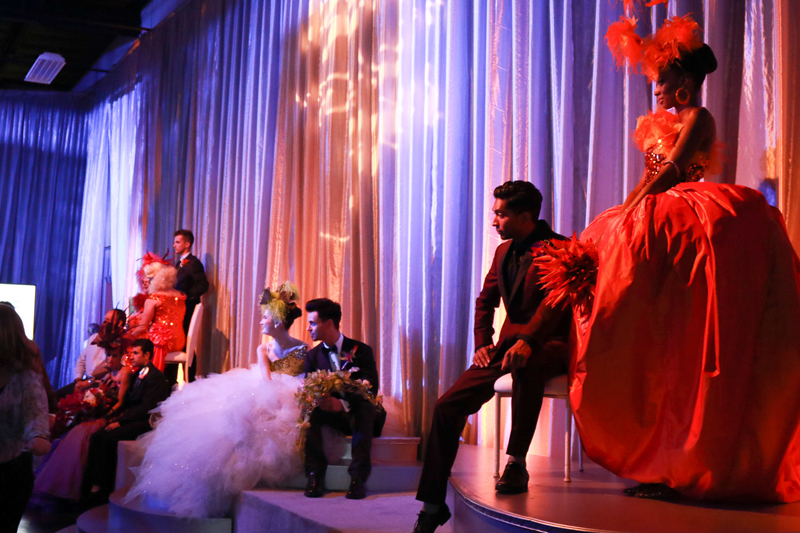 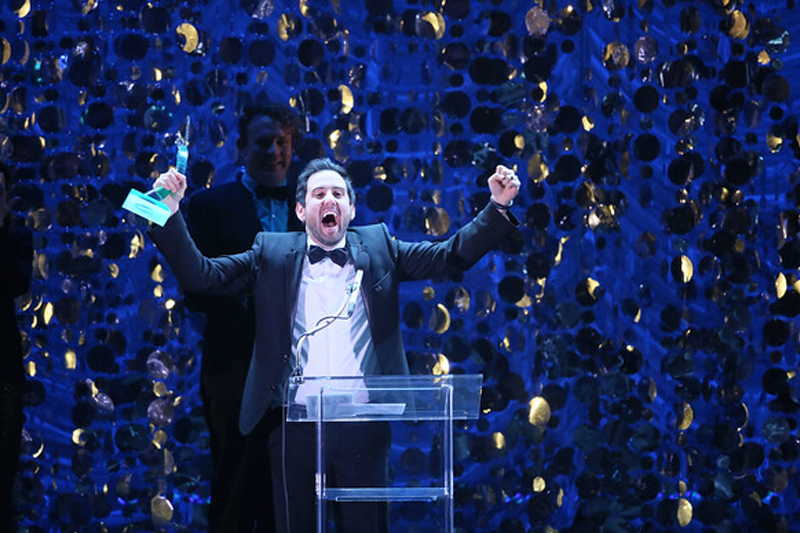 Emmy's Governor’s Ball – Reigning With Radiance. 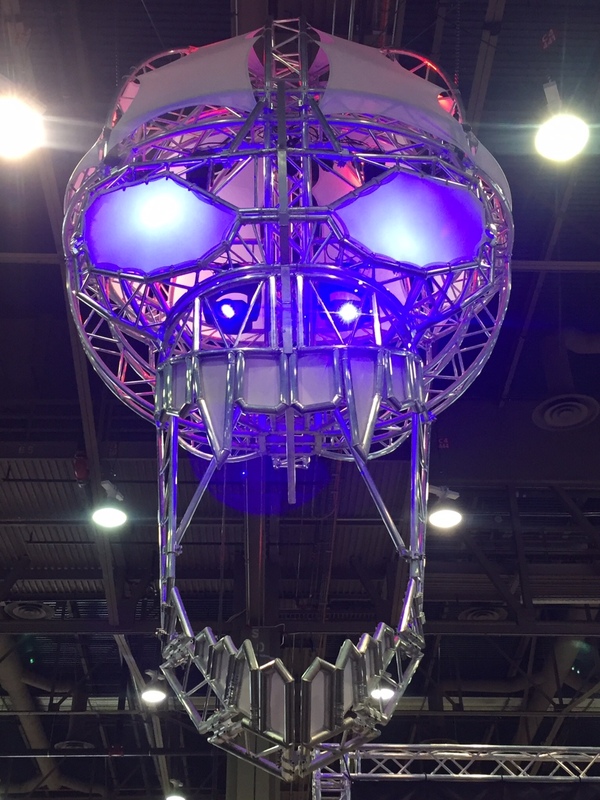 Cosmic Truss's Skull with eyes fabricated with Trapeze Plus from the LDI show in Nov. 2016. 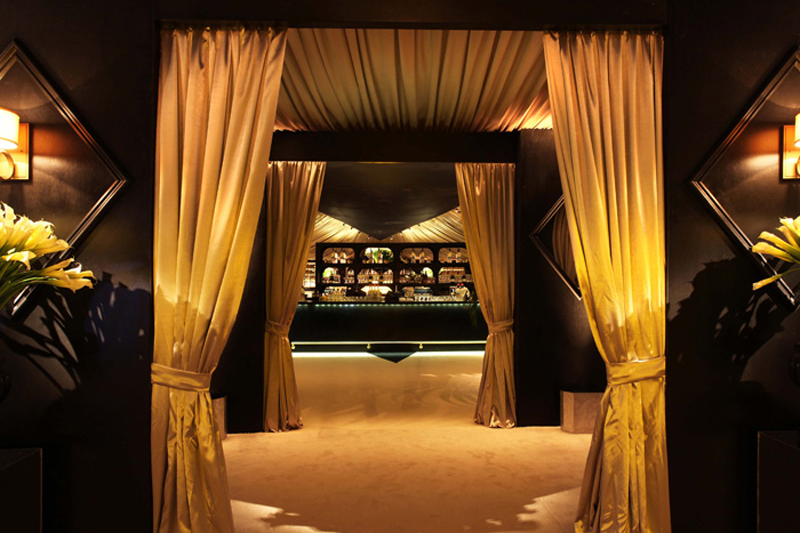 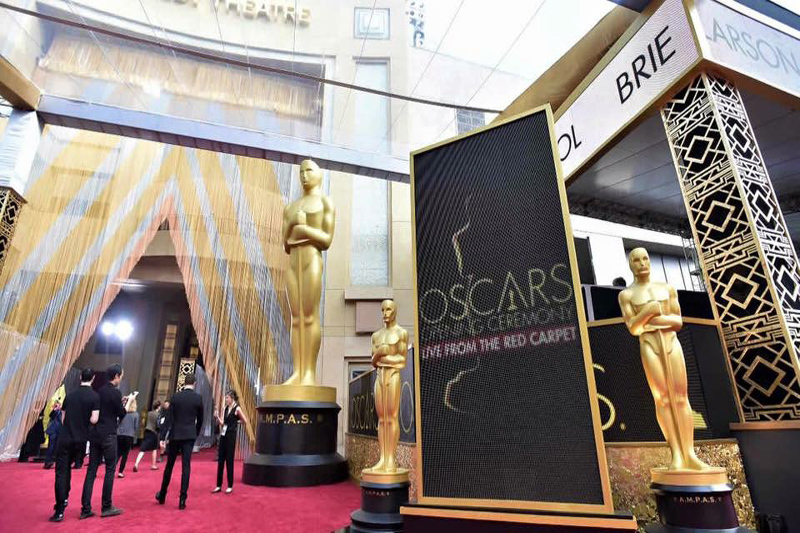 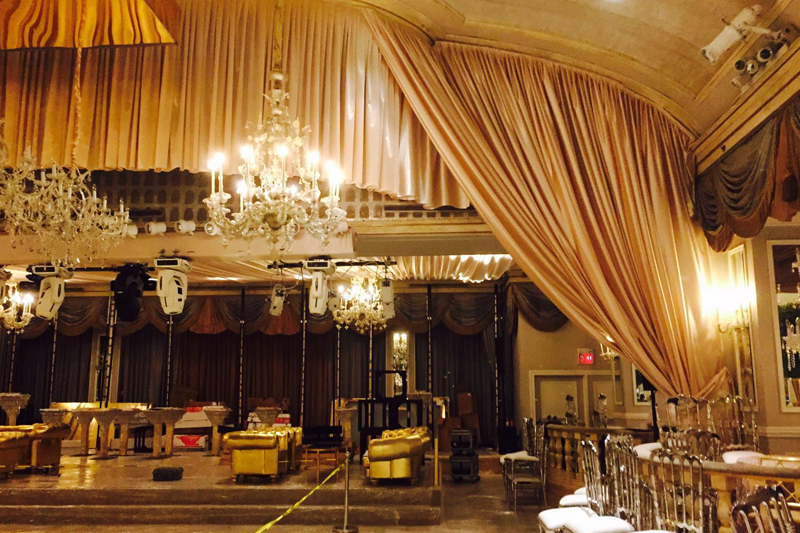 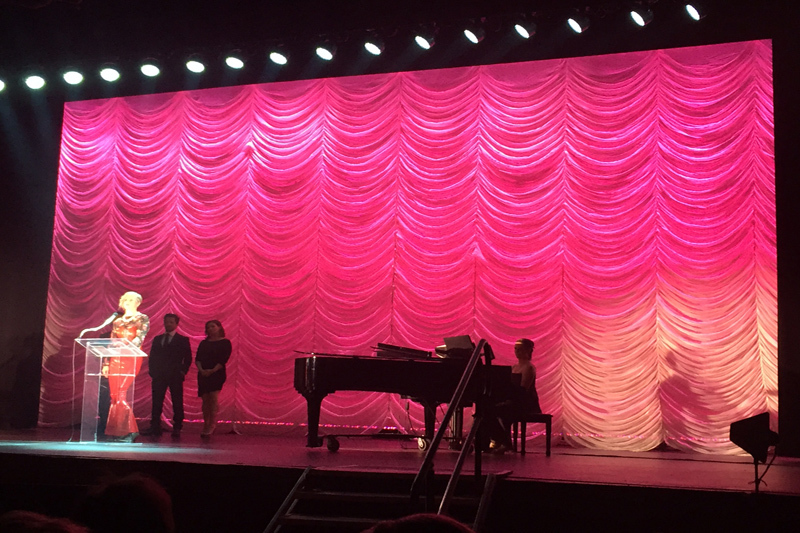 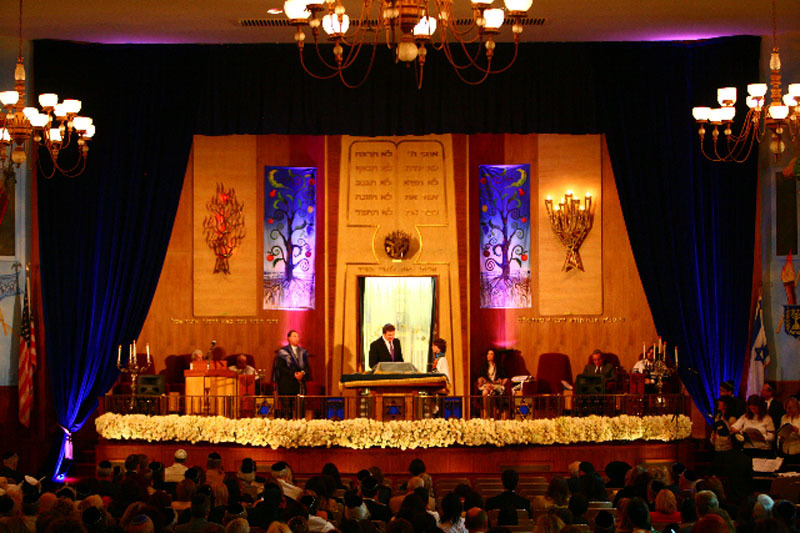 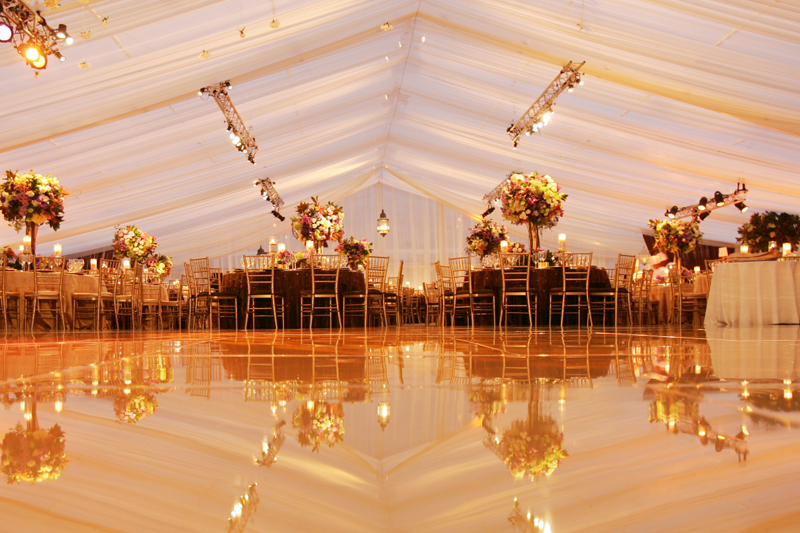 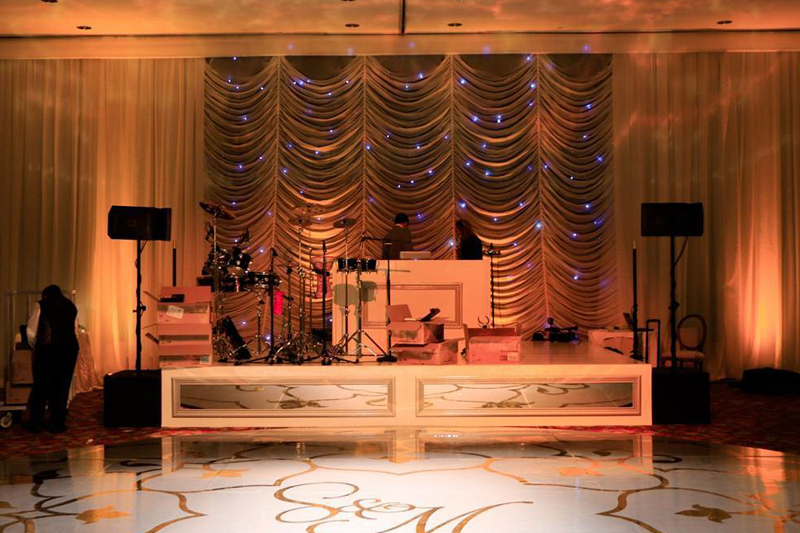 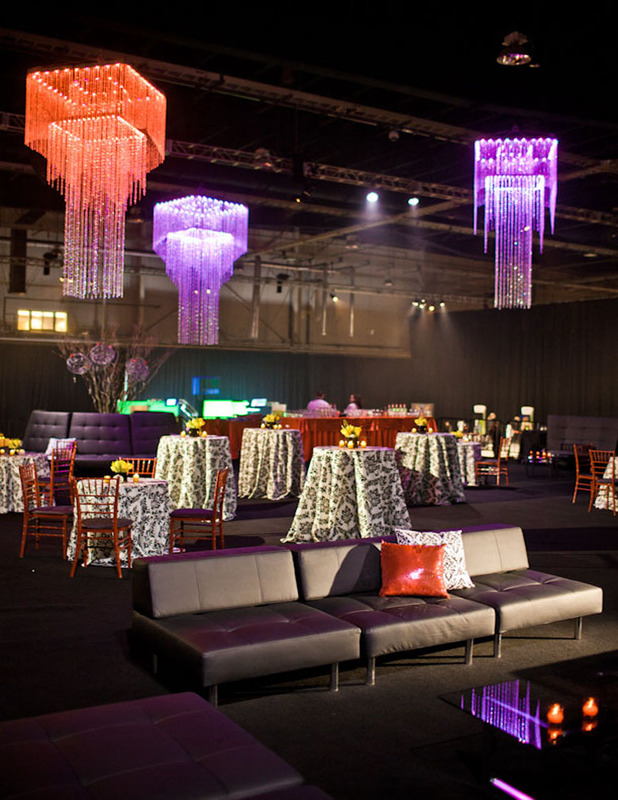 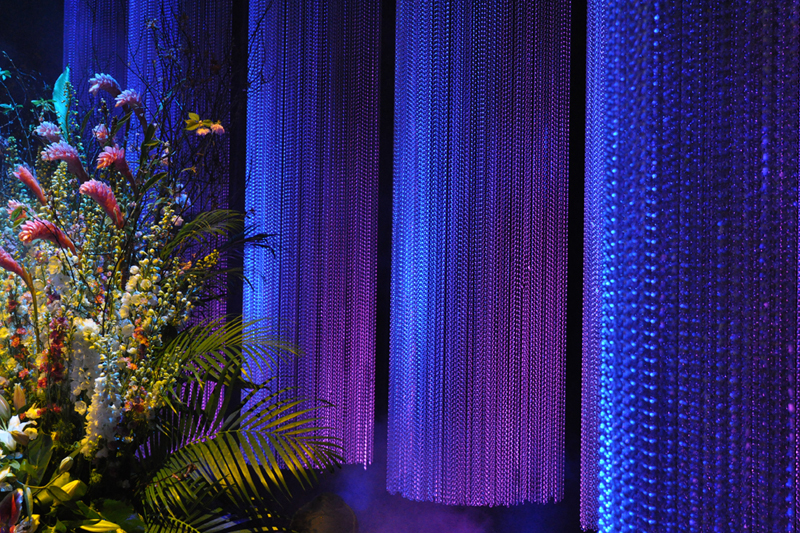 Stage decor created from Black Milano, Silver bead curtains and Gold Strie Satin. 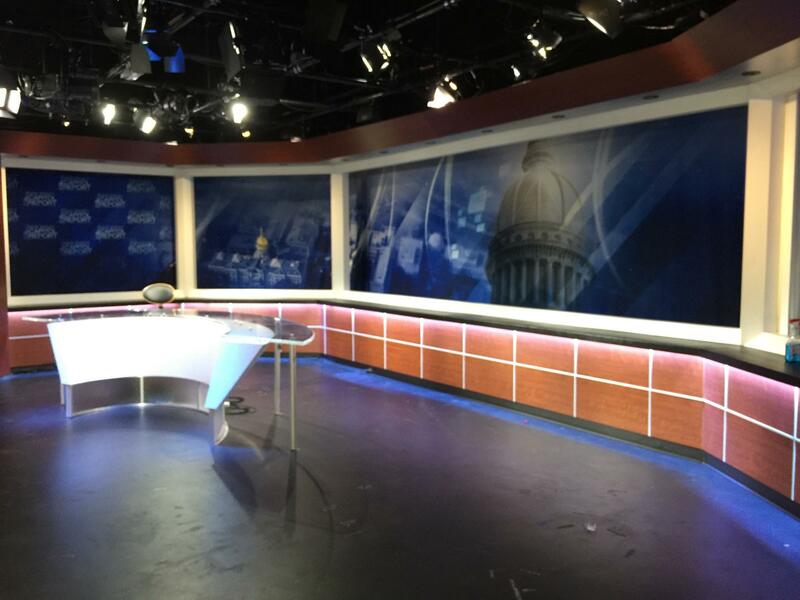 Custom Screen made for the new NJ TV newsroom made from printed Triple White and placed on a flexible track. 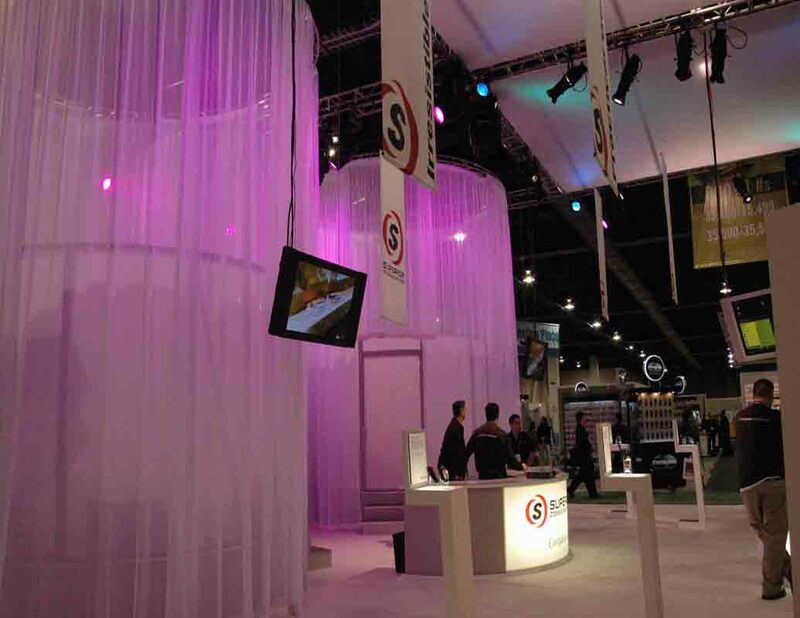 SEG Frames, custom printing/fabrication, various fabrics/products. 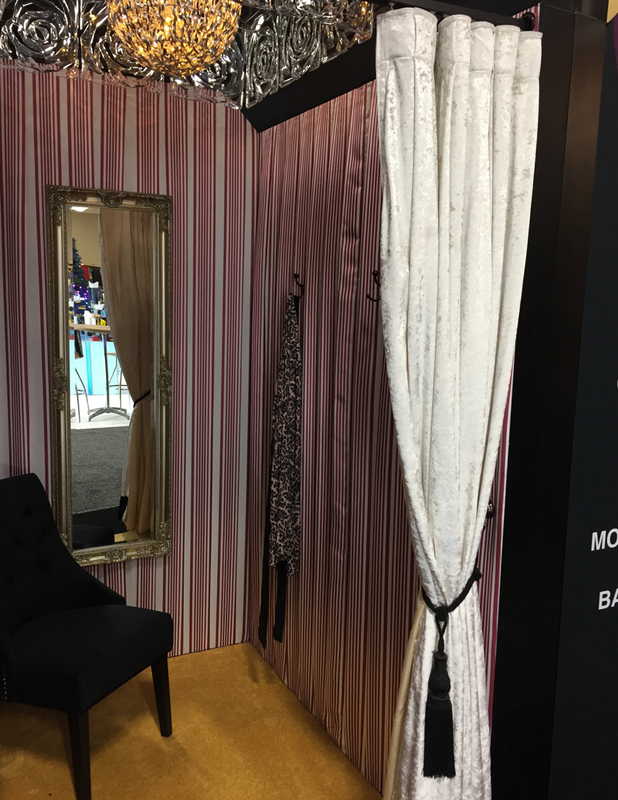 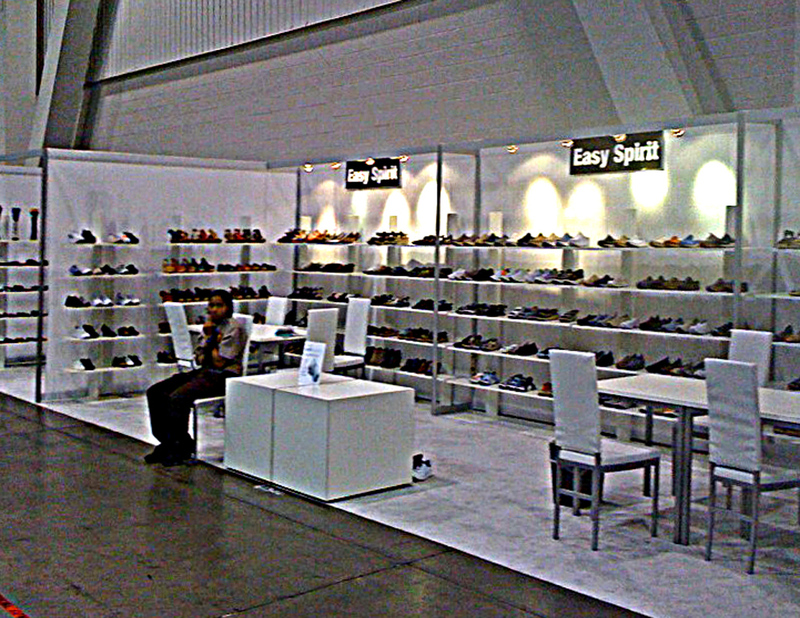 Global Shop Booth Design. 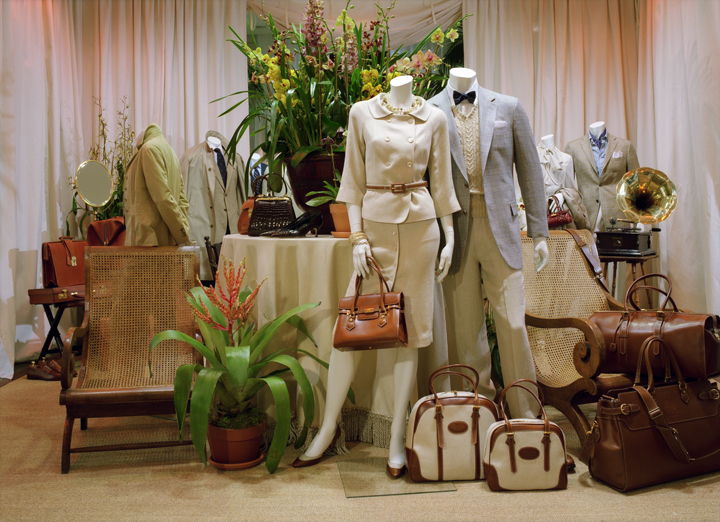 Brooks Brothers Showroom, NY. 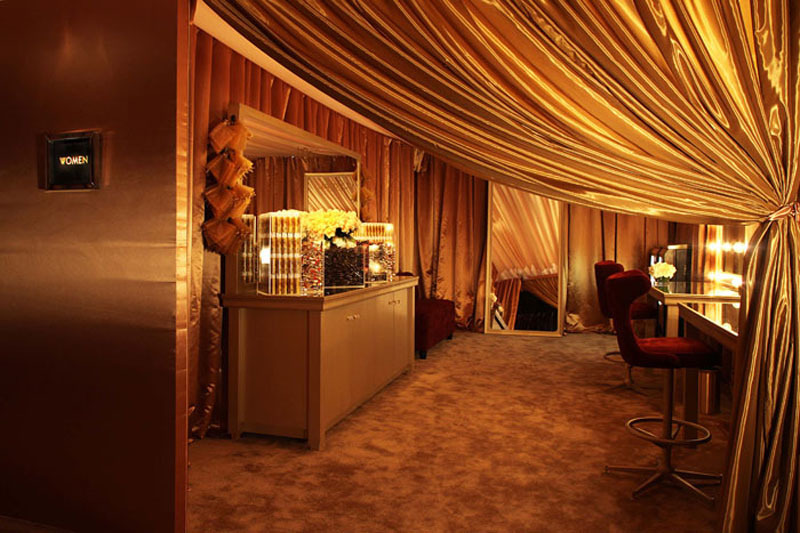 Custom curtains.